本发明公开一种正交频分多路复用符号的传输方法和系统。 The present invention discloses a transmission method and an orthogonal frequency division multiplex symbol system. 在本发明的一些实施例中，提供一种用于传送整数数目的OFDM符号的帧结构，其中一些的OFDM符号将按照单播模式传送，一些OFDM符号将按照广播格式传送。 In some embodiments of the present invention, there is provided a frame structure of an integer number of OFDM symbols used for transmission, some of the OFDM symbols transmitted in a unicast mode, the number of OFDM symbols transmitted according to the broadcast format. 所述帧结构包括把帧分成至少两个部分，以在该帧中容纳单播模式和广播模式的划分。 The frame comprises the frame structure into at least two portions to divide the frame received in unicast mode and broadcast mode. 所述帧结构被用于从至少一个发射器串行地传送多个帧。 The frame structure is used for a plurality of frames transmitted from the at least one transmitter serially. 单播模式支持从单一发射器到单一接收器的OFDM符号的传输。 Support unicast mode transmission from a single transmitter to a single receiver of OFDM symbols. 广播模式支持从多个发射器到在所述多个发射器的范围内的所有接收器的OFDM符号的传输。 Broadcast mode supports transmission from a transmitter to multiple receivers in all the range of the plurality of transmitters of OFDM symbols. 组播模式支持从多个发射器到在所述多个发射器的范围内的多个接收器的OFDM符号的传输。 Mode supports multicast transmission from multiple transmitters to a plurality of receivers within said plurality of emitters of OFDM symbols. 本申请是于2006年3月30日提出的、题为"正交频分多路复用符号的传输方法和系统"的中国专利申请No. 200680017857. 8的分案申请。 China Patent  This application is March 30, 2006 presented, entitled "transmission method and system of orthogonal frequency division multiplexing symbol" divisional application of application No. 200680017857.8 of. 本申请要求2005年3月30日提交的美国临时专利申请No. 60/666, 548和2005年4月26日提交的美国临时专利申请No. 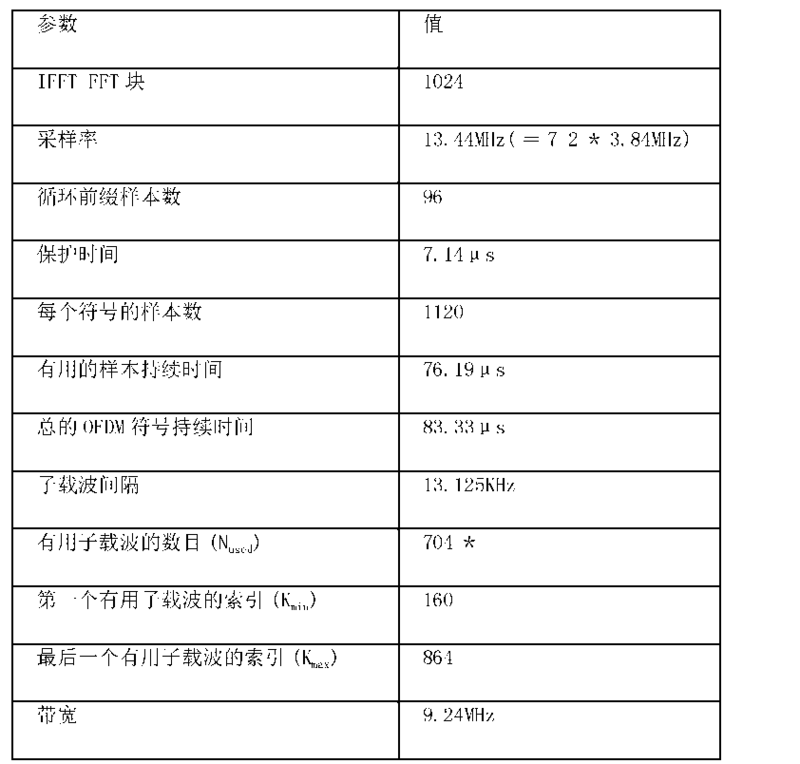 60/674, 904的优先权，其在此全文引用作为参考。  This application claims the benefit of US Provisional Patent March 30, 2005 filed No. 60/666, 548 and US Provisional Patent April 26, 2005 filed Application No. 60/674, 904, which It is hereby incorporated by reference. 本发明涉及无线通信领域，更具体地说，涉及支持单播和多播0FDM传输的系统和方法。  The present invention relates to the field of wireless communications, and more particularly, to a system and method for supporting multicast and unicast transmissions 0FDM. 正交频分多路复用（0FDM)是一种通过在频域中具有非常精确的间隔的许多载波分发数据的多路复用形式。  Orthogonal Frequency Division Multiplexing (0FDM) having a very precise by multiplexing many carriers spaced form the distribution data in the frequency domain. 载波的精确间隔提供几个优点，比如频谱效率高，对射频干扰的适应性和较低的多径失真。 Exact spacing of the carriers provides several advantages, such as high spectrum efficiency, flexibility of RF interference, and lower multipath distortion. 由于其有益性质和在多径衰减无线信道中的出众性能，0FDM已被看作高数据速率无线通信领域，例如无线城域网（MAN)中的有用技术。 Due to its beneficial properties and superior performance in a multipath fading radio channel, has been seen 0FDM high data rate wireless communications, such as wireless metropolitan area network (MAN) is a useful technique. 无线MAN是通过固定、便携和移动宽带接入系统的空中接口实现的网络。 Wireless MAN air through the fixed, portable and mobile broadband access network interface system. 利用0FDM空中接口的无线网络能够传送不同类型的数据传输，比如单播传输、多播传输和广播传输。  The use of wireless networks 0FDM air interface capable of transmitting different types of data transmission, such as unicast transmission, multicast transmission and broadcast transmission. 由于帧中0FDM符号之间的不同大小的保护间隔，不同类型的传输导致不同大小的传输帧。 Due to the different sizes of the guard interval between the symbols 0FDM frames, different types of transmission result in transmission frames of different sizes. 按照本发明的第一方面，提供一种方法，所述方法包括：在帧中安排多个0FDM符号，以便在该帧的单播模式部分中和该帧的广播模式部分中支持自单个发射器的0FDM符号传输；在其中每一帧具有相同的帧持续时间的一系列帧中传送该帧。  According to a first aspect of the present invention, there is provided a method, the method comprising: arranging a plurality of symbols in a frame 0FDM to broadcast mode portion of the frame from the support unicast mode portion of the frame 0FDM single transmitter symbol transmission; in the series of frames wherein each frame having the same frame duration of the frame transmitted. 在一些实施例中，所述方法还包括对于所述一系列帧中的每一帧，使多个发射器中的至少两个发射器的传输同步，从而所述至少两个发射器同步地划分单播模式和广播模式。  In some embodiments, the method further comprising for each frame of said series of frames of the plurality of transmitters transmit at least two transmitters synchronized to said at least two transmitters synchronization divided unicast mode and broadcast mode. 在一些实施例中，在帧中安排0FDM符号包括：把该帧分成多个持续时间相等的部分；把该帧划分成单播模式部分和广播模式部分，以便与把该帧分成多个持续时间相等的部分的边界一致。  In some embodiments, the symbol arrangement in the frame 0FDM comprising: the frame into the plurality of portions of equal time duration; the frame into the unicast mode portion and broadcast mode portion of the frame so as to be divided into multiple consistent boundary equal duration part. 在一些实施例中，把帧分成多个持续时间相等的部分包括把帧分成五个持续时间相等的部分。  In some embodiments, the frame is divided into a plurality of equal duration portions comprises the frame into five equal duration portions. 在一些实施例中，与帧的单播模式部分中的0FDM符号相比，帧的广播模式部分中的0FDM符号包括更长的保护间隔。  In some embodiments, as compared to a unicast mode portion of the frame 0FDM symbol, the symbol 0FDM broadcast mode portion of the frame comprises a guard interval longer. 在一些实施例中，在帧中安排多个0FDM符号包括对利用单播模式和广播模式传送的0FDM符号采用公共的采样频率和公共的FFT大小。  In some embodiments, the plurality 0FDM symbols arranged in a frame comprises using the symbols 0FDM unicast mode and broadcast mode transmission using a common sampling frequency and a common FFT size. 在一些实施例中，所述方法还包括定义多个帧结构，每个帧结构包括特定的单播模式部分和广播模式部分，以及传送识别正在使用哪个帧结构的帧结构标识符。  In some embodiments, the method further comprises defining a plurality of frame structures, each frame structure comprises a specific unicast mode portion and broadcast mode portion, and transmitting a frame structure identifier identifying a frame structure which is being used. 在一些实施例中，所述方法还包括利用帧的广播模式部分从发射器发射单播模式0FDM符号，其中保持广播模式部分的持续时间，好像正在发射广播模式0FDM符号那样。  In some embodiments, the method further comprises using the broadcast mode portion of the frame transmit mode 0FDM unicast symbols from the transmitter, wherein the duration of the holding portion of the broadcast mode, if a broadcast mode is transmitting symbols as 0FDM. 在一些实施例中，所述方法还包括：对于单个小区中的广播模式，利用帧的单播模式部分从发射器发射广播模式0FDM符号，其中保持单播模式部分的持续时间，好像正在发射单播模式0FDM符号那样。  In some embodiments, the method further comprising: for broadcast mode in a single cell, using the unicast mode portion of the frame transmit mode 0FDM broadcast symbols from the transmitter, wherein the duration of the holding portion of the unicast mode, if unicast mode 0FDM being launched as a symbol. 在一些实施例中，所述一系列帧还包括下述至少之一：只用于单播模式传输的帧； 和只用于广播模式传输的帧。  In some embodiments, the series of frames further comprises at least one of the following: a frame only for unicast mode transmission; and only frames for broadcast mode transmissions. 在一些实施例中，所述方法还包括：把每个帧分成多个子帧；逻辑上把每个子帧再分成多个时隙；沿着时隙边界在单播模式和广播模式之间划分每个帧。  In some embodiments, the method further comprising: dividing each frame into a plurality of sub-frames; logically subdivided into a plurality of sub-frame for each time slot; along slot boundaries unicast mode and broadcast mode of divided between each frame. 在一些实施例中，所述方法还包括：把每个帧分成多个子帧；逻辑上把每个子帧再分成多个时隙；在所述多个子帧中的子帧子集内，沿着0FDM符号边界划分单播模式和广播模式，并把每个剩余子帧全部用于单播模式或广播模式之一。  In some embodiments, the method further comprising: dividing each frame into a plurality of sub-frames; logically subdivided into a plurality of subframes each of slots; sub-set within the plurality of subframes in subframes , symbol boundaries along 0FDM divided unicast mode and broadcast mode, and all of the remaining subframes for each unicast mode or broadcast mode one. 按照本发明的第二方面，提供一种接收包含多个0FDM符号的帧的方法，所述方法包括：接入发送帧的通信网络；接收可从中确定帧结构的信息；按照帧结构接收多个0FDM 符号，其中所述帧结构包含单播模式部分和广播模式部分。  According to a second aspect of the present invention, there is provided a method of receiving a frame comprising a plurality of 0FDM symbols, the method comprising: transmitting an access communication network frame; receiving information from which a frame structure is determined; according to the frame structure 0FDM receiving a plurality of symbols, wherein the frame structure comprises a unicast mode portion and a broadcast mode portion. 在一些实施例中，接收信息包含确定广播控制信道在多个0FDM符号内的位置，并从广播控制信道中提取可从中确定帧结构的信息。  In some embodiments, determining the location information comprises receiving a broadcast control channel in a plurality of 0FDM symbols, and extracts the information from the broadcast control channel frame structure may be determined therefrom. 按照本发明的第三方面，提供一种通信网络，包括：多个电信小区，每个小区包含至少一个发射器，并被分成至少两个部分；至少一个子网，所述至少一个子网由所述多个电信小区中的至少两个相邻电信小区的各个部分构成，所述至少一个子网由下述之一支持： 所述至少两个相邻电信小区之一的用于单播模式传输的发射器，所述至少两个相邻电信小区之一的用于单小区广播模式传输的发射器，和全部所述至少两个相邻电信小区的用于广播传输的发射器，其中所述至少一个子网的发射器适合于在相同的传输帧结构中按照单播模式和广播模式传送0FDM符号。  According to a third aspect of the present invention, there is provided a communication network, comprising: a plurality of telecommunication cells, each cell comprising at least one transmitter and divided into at least two portions; at least one sub-network, said at least one subnetwork composed of at least two respective portions of adjacent telecommunication cells of the plurality of telecommunication cells, the at least one subnet supported by one of the following: one of the at least two adjacent telecommunication cells for unicast transmission mode transmission, at least two adjacent transmitters for single-cell broadcast mode transmissions one telecommunications cell, and all of the at least two adjacent transmitters for broadcast transmission of telecommunication cells wherein the at least one sub-network transmitter adapted to transmit a unicast symbol 0FDM mode and broadcast mode in a same transmission frame structure. 在一些实施例中，当存在一个以上的子网时，至少一个子网传送不同于其它子网的内容。  In some embodiments, when there is more than one subnet, different from the content of the at least one subnet to other subnets transfer. 在一些实施例中，当存在一个以上的子网时，所述子网传送相同的内容。  In some embodiments, when there is more than one subnet, the subnet transmit the same content. 在一些实施例中，通过利用下述至少之一，每个子网减轻由相邻子网传送的相同内容的传播延迟引起的干扰：供传输之用的不同扰码和不同子信道配置。  In some embodiments, by using at least one of the following, each subnet propagation mitigate interference from the neighboring subnet same content transmitted due to delay: used for transmission of different scrambling codes and different subchannel configuration . 在一些实施例中，对于所有发射器同时发射的各个帧来说，用于在特定子网中发射的所有发射器的帧结构都相同。  In some embodiments, each frame for all transmitters simultaneously transmitted, the frame structure used for all transmitters transmitting in a particular sub-network are the same. 在一些实施例中，使由至少一个子网的每个发射器传输每一帧同步，以便同时发生。  In some embodiments, the transmitter transmits at least one subnet of each frame of each synchronized to occur simultaneously. 对于本领域的技术人员来说，结合附图，根据本发明的具体实施例的下述说明，本发明的其它方面和特征将变得明显。  to those skilled in the art, in conjunction with the accompanying drawings, the following description of specific embodiments of the present invention, other aspects and features of the present invention will become apparent. 图15是按照本发明的一个实施例的蜂窝通信系统的示意图。  FIG. 15 is a schematic diagram of a cellular communication system according to an embodiment of the present invention. 在本发明的一些实施例中，提供一种用于传送整数的0FDM符号的帧结构，其中采用帧的划分在同一帧中以单播模式和广播模式传输0FDM符号。  In some embodiments of the present invention, there is provided a frame structure of the transmitted symbol 0FDM integer for which the use of the division frame 0FDM symbols transmitted in the same frame in unicast mode and broadcast mode. 在一些实施例中，该帧结构被用于从基站到在基站的范围内的移动终端的下行链路通信。 In some embodiments, the frame structure is used for downlink communications from the base station to the mobile terminal in the range of the base station. 该帧结构被用于从至少一个发射器，例如基站（BS)串行传送多个帧。 The frame structure is used from at least one transmitter, such as base station (BS) transmits serially a plurality of frames. 单播模式支持在单一小区中发生的从单个发射器到单个接收器的0FDM符号的传输。 0FDM support unicast mode transmission symbols occurring in a single cell from a single transmitter to a single receiver. 广播模式支持从分别在各个小区中的多个发射器到在相应小区的范围内的所有接收器的0FDM符号的传输。 0FDM broadcast mode supports transmission of symbols each from a plurality of transmitters in each cell to all receivers in the range of the corresponding cell. 广播模式还支持从多个发射器到在所述多个发射器的范围内的多个接收器的0FDM的传输。 Broadcast mode also supports transmission from multiple transmitters to a plurality of receivers within said plurality of emitters of 0FDM. 广播模式还支持从单一小区中的一个发射器到该小区内的多个接收器的0FDM符号的传输。 Broadcast mode also supports a single cell from a transmitter to one transmitted symbol 0FDM plurality of receivers within the cell. 图6表示帧600的示意图，在帧600期间，在时间T内发射多个0FDM符号，并且帧600的第一部分610被用于广播模式部分中的0FDM符号的传输，帧600的第二部分620被用于单播模式部分中的0FDM符号的传输。  FIG. 6 shows a schematic view of the frame 600, during a frame 600, a plurality of transmit symbols 0FDM time T, and the frame 610 is used for transmitting broadcast mode first portion 600 in 0FDM symbols, the first frame 600 of the second part 620 is used to transmit unicast 0FDM symbol pattern portion of. 在一些实施例中，对发射器发射的一系列连续帧中的每一帧按照基本相同的方式把帧划分成广播模式部分610和单播模式部分620。  In some embodiments, a series of continuous frames transmitted by the transmitter according to each frame in substantially the same manner as the frame 610 is divided into a broadcast mode portion and the unicast mode portion 620. 在一些实施例中，对多个发射器应用相同的划分。 In some embodiments, a plurality of transmitters use the same division. 例如，某一帧中的第一批OFDM符号可被专用于广播模式，填充该帧的剩余的OFDM符号被专用于单播模式。 For example, in a certain frame of the first OFDM symbols may be dedicated to a broadcast mode, frame filling the remaining OFDM symbols are dedicated to unicast mode. 相反，某一帧中的第一批OFDM符号可被专用于单播传输模式，填充该帧的剩余的OFDM符号被专用于广播传输模式。 In contrast, in a certain frame of the first OFDM symbols may be dedicated to unicast transmission mode, filling the remaining OFDM symbols in the frame are dedicated to broadcast transmission mode. 在一些实施例中，帧被分成多个部分或者说子帧，每个部分或者子帧具有相等的持续时间。  In some embodiments, the frame is divided into a plurality of parts or sub-frames, each sub-frame having a portion or equal duration. 在一些实现中，子帧被称为传输时间间隔（TTI)。 In some implementations, the subframe is called a transmission time interval (TTI). 例如，持续时间等于10ms的帧可包括持续时间均为2ms的五个子帧。 For example, 10ms duration equal to the frame may include a duration of 2ms are five subframes. 更一般的是，帧中的子帧的数目是实现特定的。 More generally, the number of subframes in a frame is implementation-specific. 在一些实施例中，帧中子帧的数目和它们各自的持续时间是可动态配置的。 In some embodiments, the number of subframes in a frame and their respective durations are dynamically configurable. 一旦在帧中设置了子帧的数目和持续时间，那么子帧的相应持续时间保持不变，直到它们被重新配置为止。 Once the number and duration of the subframe in the frame, then the corresponding sub-frame duration remains constant, so far until they are reconfigured. 在0FDM系统中，常常使用保护间隔来减少连续0FDM符号之间的符号间干扰(ISI)。  In 0FDM system, a guard interval is often used to reduce inter-symbol interference (ISI) between consecutive symbols 0FDM. 在一些实施例中，保护间隔包括循环前缀，它是0FDM符号中的有效数据负载的端部的特定数目的样本的复制。 In some embodiments, the guard interval comprises a cyclic prefix, which is replicated a certain number of end of the effective symbol data load 0FDM samples. 在顺序传送的0FDM符号之间的保护间隔中传送循环前缀。 Transmitting a cyclic prefix guard interval between symbols transmitted 0FDM order. 沿着多条路径从BS到移动终端的帧的传输导致帧中的每个0FDM符号和每个0FDM 符号的延迟副本时延扩展地到达移动终端。  reach the mobile terminal to the transmission frame from the BS of the mobile terminal cause delayed copies of each symbol frame 0FDM 0FDM each symbol delay spread along a plurality of paths. 每个OFDM符号和OFDM符号副本的相应循环前缀使每个0FDM符号可被重新对齐，保持0FDM符号的正交性。 Corresponding cyclic prefix of each symbol and the symbol replica 0FDM each OFDM OFDM symbols can be re-aligned to maintain orthogonality 0FDM symbols. 在一些实施例中，在0FDM符号的广播模式传输中使用的循环前缀，或者更一般地说保护时间具有和0FDM符号的单播模式传输相比，数目更大的样本。  In some embodiments, the cyclic prefix used in a broadcast mode transmission 0FDM symbols, or more generally the guard time has the unicast mode transmission symbols compared 0FDM, a greater number of samples. 这是因为当移动终端正在从位于多个小区中的多个BS，而不是从位于单一小区中的单个BS接收0FDM符号时，可能存在广播0FDM符号的更多的多径延迟和/或传播延迟。 This is because when the mobile terminal is the delay from a plurality of multipath delay in the BS plurality of cells, rather than from a single time in a single cell BS receives 0FDM symbols, there may be more 0FDM broadcast symbols and / or propagation . 在一些实施例中，在0FDM符号的广播模式传输中使用的循环前缀，或者更一般地说保护时间具有和0FDM符号的单播模式传输相同数目的样本。 In some embodiments, the cyclic prefix used in a broadcast mode transmission 0FDM symbols, or more generally the guard time and a sample having a unicast transmission mode 0FDM same number of symbols. 例如，对于单小区广播，不需要更长的保护时间，因为不存在要避免的传播延迟。 For example, for single-cell broadcast, no longer guard time, to be avoided because there is no propagation delay. 在一些实施例中，0FDM符号的单播模式和广播模式的有效数据负载持续时间相同。 In some embodiments, the unicast mode and broadcast mode 0FDM valid data symbols with the same load duration. 在一些实现中，0FDM符号具有相同的持续时间，这由采样率和FFT大小决定，而和该符号传送的内容无关。 In some implementations, 0FDM symbols have the same duration, which is determined by the sampling rate and FFT size, and the contents of which are independent of the transmitted symbols. 于是，如果循环前缀的大小在这两种模式之间变化，那么这两种模式的相应0FDM符号的总长度相差与相应循环前缀之间长度方面的差值相同的量。 So, if the cycle changes between the two modes prefix size, then the total length of the respective symbol 0FDM these two modes differ in terms of length corresponding to the difference between the amount of the same cyclic prefix. 在一些实施例中，相同模式类型，单播模式或广播模式的0FDM符号具有不同的持续时间。  In some embodiments, the same pattern type, unicast mode or broadcast mode 0FDM symbols with different durations. 例如，都按单播模式传送的两个0FDM符号可具有相同的FFT大小，但是保护时间可能变化特定数目的样本。 For example, two 0FDM all symbols transmitted by unicast mode may have the same FFT size, guard time may vary but the specific number of samples. 在一些实现中，0FDM符号持续时间方面的这种差异是适当的， 以利用帧的全部持续时间。 In some implementations, this difference of duration of 0FDM symbol is appropriate to utilize the full duration of the frame. 选择供广播模式之用的循环前缀的长度是传输性能和频谱效率之间的折衷。  The cyclic prefix for the selection of a broadcast mode is a compromise between the length of the transmission performance and spectrum efficiency. 循环前缀（它是信号开销的分量）越长，那么在固定的帧持续时间内能够传送的数据越少。 The cyclic prefix (which is a component of the overhead signal) longer, then fewer data within a fixed frame duration can be transferred. 对于10MHz的传输带宽来说，帧持续时间的一个例子是10ms。 For a transmission bandwidth of 10MHz, one example of the frame duration is 10ms. 但是，当然帧持续时间可以大于或小于10ms，并且带宽可以大于或小于10MHz。 However, of course, a frame duration may be greater or less than 10ms, and the bandwidth may be greater or less than 10MHz. 在只包括单一模式（广播模式或者单播模式）的帧中，对于整个帧来说，所有的0FDM符号具有不变的持续时间，因为每个0FDM符号的保护时间相等。  In the frame includes only a single mode (broadcast mode or a unicast mode), for the entire frame, all the symbols have the same 0FDM duration, because the guard time equal 0FDM of each symbol. 在一些实施例中，当以广播模式和单播模式传送包括0FDM符号的帧时，进行广播模式部分和单播模式部分的划分，以保证：保持总的帧持续时间；帧包括整数数目的0FDM 符号；和对于一个以上发射器（例如多小区广播情形中的BS)的对应传输的广播和单播模式，使划分同步。  In some embodiments, when transmitting a broadcast mode and unicast mode frame including 0FDM symbols, dividing the broadcast mode portion and the unicast mode portion to ensure that: keep the total frame duration; frame comprises an integer 0FDM number of symbols; and for a more transmitters (e.g. BS in a multi-cell broadcast case) broadcast and unicast transmission modes corresponding to the division of synchronization. 在一些实施例中，通过利用发射器易得到的，例如从全球卫星定位系统(GPS)得到的外部定时信息，可实现划分的同步。 In some embodiments, the transmitter by using readily available, for example, an external timing information derived from the Global Positioning System (GPS), synchronization can be divided. 在一些实施例中，通过在帧的初始部分中使用同步信道，可实现划分的同步。 In some embodiments, by using the synchronization channel in an initial portion of a frame, synchronization can be divided. 包括单播和广播的帧。  The frame including the unicast and broadcast. 在其它实施例中，发射器发出的每一帧包括单播模式传输和广播模式传输。 Each  In other embodiments, the transmitter includes a unicast frames sent and broadcast mode transmission mode transmission. 图7 和8是其中按照单播模式传送所有0FDM符号的帧的例子。 7 and FIG. 8 is an example of a frame wherein all symbols 0FDM transmitted in a unicast mode. 图9是其中按照广播模式传送所有0FDM符号的帧的例子。 FIG 9 is an example wherein the transmission frame 0FDM all symbols according to the broadcast mode. 图10-14是包括单播模式和广播模式的帧的例子。 Figures 10-14 includes a frame is a unicast mode and broadcast mode examples. 图7中表不了支持0FDM符号的单播传输模式的帧结构的例子。 Examples of unicast frame transmission mode of the structure  FIG. 7 0FDM symbol table can not support. 帧700被表不成持续时间为l〇ms。 Table 700 is not the frame duration l〇ms. 在帧700中存在五个子帧710、711、712、713、714，每个子帧的持续时间为2ms。 There are five subframes 710,711,712,713,714 in the frame 700, the duration of each subframe is 2ms. 每个子帧被分成三个时隙720、721、722,每个时隙的持续时间为666. 67μs。 Each subframe is divided into three time slots 720,721,722, for the duration of each slot 666. 67μs. 每个时隙包括持续时间为166. 67μs的四个0FDM符号块730-733。0FDM符号块730-733都包含持续时间为83. 33μs的两个0FDM符号740、741。 Each slot includes a duration 166. 67μs 0FDM four symbol blocks 730-733 contain 730-733.0FDM symbol block duration of two symbols 0FDM of 740,741 83. 33μs. 每个0FDM符号包括96个样本的循环前缀和包括1024个样本FFT的有效数据负载。 0FDM Each symbol includes a cyclic prefix of 96 samples and the effective payload comprises 1024 samples of FFT. 每个子帧包括24个0FDM符号，于是，帧总共包括120个0FDM符号。 Each subframe includes 24 0FDM symbols, thus, the frame comprising a total of 120 symbols 0FDM. 当然循环前缀和有效数据负载的持续时间并不局限于这些特定值，相反可根据所需的实现而变化。 Of course, cyclic prefix duration and the valid data is not limited to the specific load values, the opposite may vary depending on the desired implementation. 图8中表不了支持0FDM符号的单播传输模式的帧结构的另一例子。 Another example of a frame configuration of the unicast transmission mode  Table 8 support not 0FDM symbol. 帧800持续时间为10ms。 800 frame duration of 10ms. 类似于图7,帧800中有五个子帧810、811、812、813、814，每个子帧的持续时间为2ms。 Similar to FIG. 7, the frame 800 has five subframes 810,811,812,813,814, duration of each subframe is 2ms. 每个子帧被分成二个时隙820、821，每个时隙的持续时间为lms。 Each subframe is divided into two slots 820, 821, each slot has a duration of lms. 时隙820、821都包括持续时间为166. 67μs的六个0FDM符号块830-835。0FDM符号块830-835都包含持续时间为83. 33μs的两个0FDM符号840、841。 820, 821 includes a slot 166. 67μs duration 0FDM six symbol blocks 830-835 contain 830-835.0FDM symbol block duration of two symbols 0FDM of 840,841 83. 33μs. 每个0FDM符号具有和图7中的0FDM符号一样的循环前缀和有效数据负载持续时间，不过显然这些值可根据所需的实现而变化。 Each symbol has 0FDM and FIG. 7 as 0FDM symbol cyclic prefix duration and the valid data load, but obviously these values ​​may vary depending on the desired implementation. 每个子帧包括24个0FDM符号，帧总共包括120个0FDM符号。 Each subframe includes 24 symbols 0FDM, 0FDM frame includes a total of 120 symbols. 图9中表示了支持0FDM符号的广播模式的帧结构的例子。  FIG. 9 shows an example of a frame structure of a broadcast mode supported 0FDM symbol. 帧900被表示成持续时间为10ms。 Frame 900 is represented as duration of 10ms. 帧900中有五个子帧910、911、912、913、914，每个子帧的持续时间为21118。 Frame 900 has five subframes 910,911,912,913,914, duration of each subframe is 21,118. 每个子帧被分成二十个0FDM符号块920-939,每个0FDM符号块包括两个0FDM符号（未示出）。 Each subframe is divided into twenty blocks 920-939 0FDM symbols, each symbol block includes two 0FDM 0FDM symbols (not shown). 每个0FDM符号包括320个样本的循环前缀，和包括1024个样本FFT的有效数据负载。 0FDM Each symbol includes a cyclic prefix of 320 samples and an effective payload comprises 1024 samples of FFT. 帧总共包括100个0FDM符号。 0FDM frame includes a total of 100 symbols. 在图9的例子中，没有提及被分成时隙的子帧，所述子帧被分割成所述二十个0FDM符号块。 In the example of FIG. 9, no mention is divided into slots of a subframe, the subframe is divided into twenty 0FDM the symbol blocks. 在一些实施例中，对于单播模式和广播模式，帧结构中的0FDM符号具有共同的采样频率和共同的FFT大小。  In some embodiments, the unicast mode and broadcast mode, 0FDM symbol frame structure having a common sampling frequency and a common FFT size. 图7、8和9中可看出性能和频谱效率之间的折衷。  FIGS. 7, 8 and 9 can be seen tradeoff between performance and spectral efficiency. 图7和8具有供单播传输的0FDM符号，每个0FDM符号具有96个样本的循环前缀，相应的每一帧总共包括120个0FDM 符号，而图9具有供广播传输的OFDM符号，每个OFDM符号具有320个样本的循环前缀，并且帧总共包括100个0FDM符号。 7 and 8 having 0FDM for unicast transmission symbols, each symbol having 0FDM cyclic prefix of 96 samples, corresponding to each frame comprises a total of 120 0FDM symbols, the OFDM symbols and Figure 9 for having a broadcast transmission, each OFDM symbols having a cyclic prefix of 320 samples, and the frame includes a total of 100 symbols 0FDM. 与广播模式相比，单播模式具有较小的开销，从而具有供信号传输之用的更多有效负载空间。 Compared with the broadcast mode, unicast mode having a small overhead, to have more space for the payload of the signal transmission purposes. 在一些实施例中，至少部分由于这两种传输模式的循环前缀的大小方面的差异，存在单播模式部分和广播部分中的0FDM符号的持续时间方面的差异。 In some embodiments, at least partly due to differences in terms of size of the cyclic prefix of the two transmission modes, there are differences in terms of the duration of the symbol 0FDM unicast mode portion and a broadcast portion. 与广播模式传输相比，单播模式传输的较小循环前缀使得能够传送更多的有效负载。 Compared with a broadcast mode transmission, a smaller cyclic prefix unicast mode transmission enables more transmission payload. 下面的表1包括在循环前缀样本数为96的场合下，用于单播模式传输的10MHz传输带宽帧的0FDM符号参数的例子。  The following Table 1 includes a number of cyclic prefix samples of the case 96, the parameters for the symbol 0FDM 10MHz transmission bandwidth frame unicast mode transmission example. 表1中关于10MHz传输带宽帧的0FDM符号参数的例证参数值并不意味对本发明的限制。  Table 1 illustrates the parameter values ​​for the 10MHz bandwidth 0FDM symbol frame parameters is not meant to limit the present invention. 参数值是随实施而特定的。 Parameter is included with the specific embodiment. 在一些实施例中，0FDM符号参数值随所需的采样率、 循环前缀样本的数目（总的保护时间）和FFT大小而变化。 In some embodiments, the parameter value 0FDM symbol with the desired sampling rate, the number (total guard time) FFT and cyclic prefix sample size varies. 尽管上面表示的0FDM参数是关于10MHz传输带宽的，不过在一些实施例中，参数可按比例提高到20MHz，以及按比例降低到1. 25MHz。  0FDM although represented by the above parameters is about 10MHz transmission bandwidth, but in some embodiments, the parameters can increase the proportion of 20MHz, and lowered in proportion to 1. 25MHz. 在一些实施例中，对于其它传输带宽， 并不相对于上面的参数缩放参数，相反对于不同传输带宽的每个相应参数，参数是完全不同的值。 In some embodiments, the transmission bandwidth for the other, not with respect to the above parameters scaling parameters, different parameters for each respective opposite transmission bandwidth, the parameter values ​​are completely different. 在一些实施例中，关于广播模式传输的10MHz传输带宽帧的0FDM符号的参数与上面的表1类似，但是，相关的值是不同的。  In some embodiments, the parameter with the above symbol 0FDM 10MHz transmission bandwidth on the broadcast frame mode transmission Table 1 Similarly, however, the correlation values ​​are different. 例如，对于广播模式传输来说，"循环前缀样本数" 可以大于96。 For example, for a broadcast mode transmission, a "cyclic prefix the number of samples" may be greater than 96. 从而，更长的前缀还改变"每个符号的样本数"和识别子载波的特定持续时间和索引的其它参数。 Thus, the longer the prefix is ​​also varying other parameters, "the number of samples per symbol," and a specific duration index and identifying subcarriers. 图10-14表不支持0FDM符号的单播模式和广播模式传输的帧结构的特殊例子。 Specific examples  10-14 0FDM symbol tables do not support unicast mode and broadcast mode transmission frame structure. 在一些实施例中，每一帧被分成多个持续时间相等的子帧，每个子帧全部被分配给广播模式或者单播模式。  In some embodiments, each frame is divided into a plurality of equal time duration subframes, each subframe is assigned to all broadcast mode or unicast mode. 在一些实现中，允许帧内的任意分配；在其它实现中，分配被限制成产生分别用于广播模式和单播模式的单一连续周期。 In some implementations, allowing arbitrary allocation within the frame; in other implementations, the allocation is limited to a single continuous periods are generated for broadcast mode and unicast mode. 下面将参考图10说明其一个例子。 10 will now be described with reference to an example of which FIG. 图10具有基本和图9相同的结构，因为帧1000被分成五个子帧，每个子帧的持续时间为2ms。 And FIG. 10 has substantially the same structure as in FIG. 9, since the frame 1000 is divided into five subframes, each subframe duration of 2ms. 图10中在单播模式部分和广播模式部分之间的帧的划分与两个相邻子帧，即子帧1013和子帧1014之间的边界相符。 Dividing the frame between unicast mode portion and broadcast mode portion in FIG. 10 and the two adjacent sub-frame, i.e., sub-frame and subframe boundaries 1013 between 1014 matches. 帧1000的子帧1014被用于按照广播模式的0FDM符号的传输。 Sub-frame 1000 is transmitted to the frame 1014 0FDM of symbols according to broadcast mode. 前面的四个子帧1010、1011、1012、1013被用于按照单播模式的0FDM符号的传输， 而不是如它们在图9中那样被用于按照广播模式的0FDM符号的传输。 The first four subframes 1010,1011,1012,1013 are used 0FDM symbols transmitted in a unicast mode, rather than as they are used as a transmission according to the broadcast mode 0FDM symbol 9 in FIG. 在图10中，按照为广播模式传输提供帧1000的一个子帧1014、为单播模式传输提供四个子帧1010、1011、1012、1013的方式划分帧1000。  In FIG. 10, frame 1000 is provided according to a broadcast mode transmission subframe 1014, provide a way for the four subframes 1010,1011,1012,1013 unicast mode transmission frame 1000 divided. 在其它实现中，支持广播模式传输的子帧的数目和支持单播模式传输的子帧的数目都分别变化，但是子帧的总数是固定的。 In other implementations, the number of subframes and the number of support unicast mode transmission subframe supporting a broadcast mode transmission, respectively, are changed, but the total number of sub-frame is fixed. 更一般地说，如上所述，帧中的子帧的总数可以大于或小于5,这两种模式中每种模式下的子帧数目的总和等于子帧的总数。 More generally, as described above, the total number of subframes may be greater or less than 5, the total number of frames in each sub-mode in which two modes is equal to the total number of subframes. 另外，在图10的例子中，前四个子帧1010、1011、1012、1013被用于单播模式传输， 最后的或者说第五个子帧1014被用于广播模式传输。  Further, in the example of FIG. 10, the front four subframes 1010,1011,1012,1013 broadcast mode transmission is used for unicast mode transmission, final or fifth sub-frames 1014 are used. 在一些实施例中，帧的单播模式部分位于帧的尾部，帧的广播模式部分位于帧的起点。 In some embodiments, the unicast mode portion of the frame located in the tail of a broadcast frame mode frame portion located at the start of the frame. 在一些实施例中，多个广播模式部分可间隔单播模式部分地出现在帧中，反之亦然。 In some embodiments, a plurality of the broadcast modes may be spaced unicast mode portion is partially present in the frame, and vice versa. 在一些实施例中，提供广播模式和单播模式之间更小的划分粒度。  In some embodiments, provide a smaller particle size divided between broadcast mode and unicast mode. 逻辑上，每个子帧被细分成时隙。 Logically, each sub-frame is subdivided into time slots. 随后，对于指定子帧，分别为广播模式和单播模式定义跨越一个或多个连续时隙的相应时间周期，其中在时隙边界发生所述划分。 Then, for a given subframe, a broadcast mode and unicast mode across one or more defined periods of time corresponding successive time slots, respectively, wherein said partitioning occurs at a slot boundary. 随后，在相应的周期中，为指定的模式传送尽可能多的0FDM符号。 Subsequently, in the corresponding period, the symbols transmitted as much as possible 0FDM specified mode. 指定子帧的所有时隙可以被分配给广播模式和单播模式之一，在这种情况下，对于该子帧来说，时隙差别变得没有关系。 All slots specified subframe may be assigned to one of a broadcast mode and unicast mode, in this case, the sub-frame, the time slot becomes the difference does not matter. 下面说明的图11中表示了这样的一个例子。 FIG 11 described below shows an example of this. 另一方面，对于某些帧，一个或多个时隙被分配给广播模式，一个或多个时隙被分配给单播模式。 On the other hand, for some frames, the one or more time slots are allocated to a broadcast mode, one or more time slots are allocated to unicast mode. 下面说明的图12中表示了这样的一个例子。 The following description of FIG. 12 shows such an example. 在其一些例子中， 把帧划分成单播模式部分和广播模式部分产生未被均匀分成各个时隙的用于单播模式和/ 或广播模式的一组0FDM符号块，相反该组0FDM符号块共同归入一组一个以上时隙内，如下面说明的图12的例子中所示。 In some examples, the frame into the unicast mode portion and broadcast mode portion generates a symbol block set 0FDM not uniformly divided into individual time slots for unicast mode and / or the broadcast mode, opposite to the set of symbol block 0FDM common examples shown in FIG classified in more than one slot 12, as explained below in a group. 图11中表不了支持单播模式和广播模式0FDM符号传输的帧结构的一个例子。  FIG. 11 example of a table can not support unicast mode and broadcast mode 0FDM symbol transmission frame structure. 和图1〇中一样，在持续时间为l〇ms的帧11〇〇中，存在五个子帧1110、1111、1112、1113、1114， 每个子帧的持续时间为2ms。 And FIG 1〇 as the frame duration l〇ms 11〇〇, there are five subframes 1110,1111,1112,1113,1114, duration of each subframe is 2ms. 每个子帧被进一步定义成包括三个时隙。 Each subframe is further defined to include three slots. 图11中单播模式部分和广播模式部分之间帧的划分与相邻子帧1110和1111之间的边界相符。 Frame between unicast mode portion and broadcast mode portion of the adjacent divided sub-frame boundary 11 matches between 1110 and 1111. 在图解说明的例子中，按照与图10中的单播模式子帧类似的方式为单播模式传输配置帧1100中的第一子帧1110的所有三个时隙。 In the illustrated example, according to a similar frame 10 in FIG unicast mode sub-frame 1100 is disposed in the first subframe for all three time slots 1110 for unicast mode transmission. 全体包含在最后的四个子帧1111、1112、1113、1114中的十二个时隙1120-1131包括用于广播模式传输的十二个时隙1120-1131，每个时隙的持续时间为0. 6667ms。 All contained in the last four subframes 1111,1112,1113,1114 are twelve slots 1120-1131 include a broadcast mode transmissions twelve slots 1120-1131, for the duration of each time slot 0 . 6667ms. 在按照这种方式分配时隙的情况下，用于指定模式的时隙被组合成用于传送尽可能多的0FDM符号（或者0FDM符号块）的单个传输资源。 In the case of the slot allocation in this manner, the time slot for the specified pattern are combined into as many 0FDM transmission symbol (or symbol block 0FDM) for a single transmission resource. 对于图解说明的特定例子， 这十二个时隙1120-1131具有足以包含^^一个0FDM广播符号块1140-1150的容量。 For the specific examples illustrated below, twelve slots 1120-1131 having a capacity sufficient to contain a broadcast symbol blocks 1140-1150 ^^ a 0FDM. ^^一个0FDM符号块1140-1150都包括两个持续时间不同的0FDM符号1160、1161。 ^^ a symbol block 1140-1150 0FDM comprises two different symbol durations 0FDM 1160,1161. 第一个0FDM 符号的持续时间为364. 891μs，第二个OFDM符号的持续时间为363. 51μs。 The duration of the first symbol is a 0FDM 364. 891μs, duration of the second OFDM symbols is 363. 51μs. OFDM符号块中的每个OFDM符号并不局限于具有不同于每个OFDM符号块中的其它OFDM符号的持续时间。 OFDM symbol in each OFDM symbol block is not limited to having a different time duration of each OFDM symbol block other OFDM symbols. 在一些实施例中，每个OFDM符号具有相同的持续时间。 In some embodiments, each OFDM symbol has the same duration. 在图11的例子中，广播模式部分中的^^一个0FDM符号块1140-1150未被均匀地分入十二个时隙1120-1131中，相反，广播0FDM符号块1140-1150共同归入四个子帧111 1、 1112、1113、1114的全部十二个时隙1120-1130内。  In the example of Figure 11, the broadcast mode portion ^^ 0FDM symbol blocks 1140-1150 is not a uniformly divided into twelve slots 1120-1131, on the contrary, the broadcast common 0FDM symbol blocks 1140-1150 classified four subframes 1111, 1112,1113,1114 all the twelve slots 1120-1130. 在一些实施例中，0FDM符号块的数目均匀地分到时隙的数目内，从而特定数目的0FDM符号块归入每个时隙内。 In some embodiments, the number of symbol block 0FDM uniformly assigned to the number of slots, so that a certain number of blocks classified 0FDM symbols each time slot. 图12表不其中0FDM符号的在单播模式传输和广播模式传输之间的划分被定义成沿着子帧内的时隙边界进行的例子。  FIG. 12 wherein the table is not an example of the division between unicast mode and broadcast mode transmission 0FDM transmission symbols are as defined for the sub-frame along a slot boundary. 帧1200的持续时间为10ms。 Duration of the frame 1200 is 10ms. 在帧1200中存在五个子帧1210、1211、1212、1213、1214,每个子帧的持续时间为2ms。 There are five subframes 1210,1211,1212,1213,1214 in the frame 1200, the duration of each subframe is 2ms. 帧1200中的前三个子帧1210、1211、1212用于单播模式0FDM符号传输。 The first three subframes 1210,1211,1212 frame 1200 for unicast mode 0FDM symbol transmission. 帧1200中的前三个子帧1210、1211、1212 可具有与图10中的单播模式子帧类似的单播模式结构。 The frame 1200 may have a first three subframes 1210,1211,1212 in FIG 10 is similar to the unicast sub-frame mode unicast mode structure. 最后的两个子帧1213U214包括四个时隙1220、1221、1222、1223，每个时隙持续时间为11118。 The last two subframes 1220,1221,1222,1223 1213U214 comprises four slots, the duration of each time slot 11118. 图12中的单播模式部分和广播模式部分的划分与相邻的时隙-11220和时隙-21221之间的边界相符。 Matching the border between the adjacent slots -21,221 -11,220 division slot and the unicast mode portion and broadcast mode portion in FIG. 12. 时隙-11220包括持续时间分别为333. 34μs的三个0FDM符号块1230、1231、1232。 -11220 slot includes a duration 0FDM are three symbols of the block 1230,1231,1232 333. 34μs. 这三个0FDM符号块1230、1231、1232支持单播模式传输。 0FDM three symbol blocks 1230,1231,1232 support unicast mode transmission. 每个0FDM符号块包括持续时间分别为166. 67μs的两个0FDM符号（未示出）。 Each symbol block includes 0FDM respectively 166. 67μs duration of two symbols 0FDM (not shown). 剩余的三个时隙1221、1222、1223包括支持广播模式传输的八个0FDM符号块1240-1247。 The remaining three slots 1221,1222,1223 support broadcast mode transmission comprises eight symbol block 0FDM 1240-1247. 每个广播模式0FDM符号块1240-1247的持续时间为375μs。 The duration of each symbol blocks 1240-1247 0FDM broadcast mode is 375μs. 八个0FDM符号块1240-1247分别包括持续时间都为187. 5μs的两个0FDM符号（未示出）。 0FDM eight symbol blocks 1240-1247 are, respectively, including the duration of two 0FDM 187. 5μs symbols (not shown). 在一些实施例中，广播模式部分和单播模式部分中0FDM符号的大小方面的差异是这两种模式的循环前缀中样本数方面的差异。 In some embodiments, the size difference aspect 0FDM symbols broadcast mode portion and the unicast mode portion is the difference in the number of samples of these two aspects of the cyclic prefix mode. 在图12的例子中，八个0FDM符号块120-1247未被均匀地分入三个时隙1221、 1222U223中，相反这八个0FDM符号块120-1247共同归入三个时隙1221、1222、1223中。  In the example of FIG. 12, eight symbol block 120-1247 0FDM not evenly divided into three time slots 1221, 1222U223, on the contrary 0FDM eight symbol blocks included in a common three slots 120-1247 1221,1222,1223 in. 在一些实施例中，0FDM符号块的数目均匀地分入时隙的数目中，从而特定数目的0FDM符号块归入每个时隙中。 In some embodiments, the number of symbol block 0FDM uniformly divided into the number of time slots, so that a certain number of blocks classified 0FDM symbols in each slot. 在一些实施例中，把帧划分成单播模式部分和广播模式部分导致这两个模式部分之间的边界出现在子帧内，此外出现在该子帧内的多个时隙中的某个时隙内。  In some embodiments, the frame into the unicast mode portion and broadcast mode portion results in a boundary portion between the two modes occur within a subframe, a plurality of time slots in addition occurs in the subframe of a time slot. 图13和14 中表示了这样的例子，下面将更详细地说明。 13 and FIG. 14 shows such an example will be described in more detail. 图13类似于图12,因为在持续时间10ms的帧1300中存在五个子帧1310、1311、 1312、1313、1314。  FIG. 13 is similar to FIG. 12, since the five subframes 1310, 1311, 1312,1313,1314 there 1300 10ms duration frame of. 这五个子帧的持续时间都为2ms，都包含三个时隙。 This duration is five subframes are 2ms, it contains three slots. 为单播模式通信配置帧1300中的前三个子帧1310、1311、1312。 1300 communication configuration frame three subframes 1310,1311,1312 unicast mode. 最后的两个子帧1313、1314包括总共六个时隙1320-1325,对于4ms的总持续时间来说，每个时隙的持续时间为0. 6667ms。 The last two sub-frames 1313 and 1314 include a total of six slots 1320-1325, for a total duration of 4ms, the duration of each slot is 0. 6667ms. 随后在该4ms 周期中并不与时隙边界相符的点把该4ms周期划分成单播模式部分和广播模式部分。 Point then is not consistent with the slot boundaries in the 4ms 4ms cycle period into the unicast mode portion and a broadcast mode portion. 具体地说，六个时隙1320-1325包括总共^^一个分别包括两个0FDM符号（未示出）的0FDM符号块1330、13311332、1340-1347。 Specifically, six slots 1320-1325 include a total ^^ 0FDM includes two symbols (not shown) of the symbol block 1330,13311332,1340-1347 0FDM. 前三个0FDM符号块1330、1331、1332支持单播模式传输， 每个0FDM符号块的持续时间为333. 34μs。 The first three 0FDM symbol blocks 1330,1331,1332 support unicast mode transmission, the duration of each symbol block is 0FDM 333. 34μs. 剩余的八个0FDM符号块1340-1347支持广播模式传输，每个0FDM符号块的持续时间为375μs。 The remaining eight symbol block 0FDM 1340-1347 support broadcast mode transmission, the duration of each symbol block is 0FDM 375μs. 在图13的例子中，^^一个0FDM符号块1330-1332、1340-1347并不均匀地分入六个时隙320-1325中，相反，^^一个OFDM符号块1330-1332、1340-1347共同归入两个子帧1313、1314的全部六个时隙1320-1325中。  In the example of FIG. 13, the symbol ^^ 0FDM a block 1330-1332,1340-1347 not uniformly divided into six time slots 320-1325 contrary, ^^ one OFDM symbol blocks 1330-1332, 1340-1347 together two sub-frames 1313 and 1314 classified all six slots in 1320-1325. 在一些实施例中，单播模式和/或广播模式的OFDM符号块的数目分别均匀地分入各个时隙中，从而和作为例子的图11和12的例子的情况一样，特定数目的OFDM符号块对应于每个时隙。 In some embodiments, the unicast mode and / or the number of broadcast mode OFDM symbol blocks are equally distributed in each slot, such as the case of the example and the example of FIGS. 11 and 12, as a certain number of OFDM symbols blocks corresponding to each timeslot. 图14表示了既支持单播传输模式，又支持广播传输模式的帧结构的另一例子。  FIG. 14 shows another example of a frame structure supporting both unicast transmission modes, and supports broadcast transmission mode. 帧1400中的第一子帧1410用于单播模式传输。 A first frame 1400 1410 subframe for unicast mode transmission. 第一子帧1410可具有和图10中的子帧单播模式结构类似的单播模式结构。 A first subframe and a subframe 1410 may have a unicast mode structure similar to FIG. 10 unicast mode structure. 最后的四个子帧1411、1412、1413、1414包括总共12个时隙1420-1431，每个时隙的持续时间为0. 6667ms。 The last four subframes 1411,1412,1413,1414 1420-1431 includes a total of 12 slots, each slot has a duration of 0. 6667ms. 在帧的子帧之一的时隙内的0FDM符号块的粒度级发生图14中的单播模式部分和广播模式部分的划分。 Dividing the unicast mode portion and broadcast mode portion in FIG. 14 particle size fraction occurs 0FDM block of symbols in a slot of one of the subframe. 12个时隙1420-1431包括总共23个0FDM符号块1440-1446、1450-1465。 12 slots 1420-1431 include a total of 23 blocks 1440-1446,1450-1465 0FDM symbols. 前七个0FDM符号块1440-1446支持单播模式传输，每个0FDM符号块的持续时间为333. 34μs。 The first seven symbol blocks 1440-1446 0FDM support unicast mode transmission, the duration of each symbol block is 0FDM 333. 34μs. 剩余的16个0FDM符号块1450-1465 支持广播模式传输，每个0FDM符号块的持续时间为354. 17μs。 The remaining 16 symbols 0FDM blocks 1450-1465 support broadcast mode transmission, the duration of each symbol block is 0FDM 354. 17μs. 每个0FDM符号块包括两个0FDM符号（未示出）。 Each symbol block includes two 0FDM 0FDM symbols (not shown). 在图14的例子中，23个0FDM符号块1440-1446、1450-1465未被均匀地分入12个时隙1420-1431中，相反23个0FDM符号块1440-1446U450-1465共同归入四个子帧1411、 1412、1413、1414的全部12个时隙1420-1431内。  In the example of FIG. 14, block 23 1440-1446,1450-1465 0FDM symbols are not uniformly divided into 12 time slots in 1420-1431, 23 opposite the common return 0FDM symbol blocks 1440-1446U450-1465 into four sub-frames 1411, 1412,1413,1414 all 12 slots within 1420-1431. 在一些实施例中，单播模式和/或广播模式的0FDM符号块都分别均匀地分入各个时隙中，从而特定数目的0FDM符号块对应于每个时隙。 In some embodiments, the unicast mode and / or the broadcast mode 0FDM symbol blocks respectively uniformly divided into each slot, so that a certain number of 0FDM symbol block corresponding to each time slot. 单播模式和广播模式之间的划分被表不成在0FDM符号块进行，但是在一些实施例中，沿着0FDM符号边界进行划分。  The partitioning between unicast mode and broadcast mode is not in the table 0FDM symbol blocks, in some embodiments, be divided along 0FDM symbol boundaries. 在一些实施例中，当在子帧之一内的时隙、0FDM符号块或者0FDM符号边界进行划分时，在所述边界定义单播模式和广播模式之间的划分，并且每个剩余的子帧被全部用于单播模式或广播模式之一。  In some embodiments, when the slot is within one of the sub-frame, block or symbol 0FDM divided 0FDM symbol boundary, the boundary is defined between unicast mode and broadcast mode is divided, and each all remaining subframes are used for one of unicast mode or broadcast mode. 在0FDM系统中，代替使用单载波来传送信号，通过也称为子载波的多个正交载波频率分发信号。  In 0FDM system, instead of using a single carrier transmission signal, the frequency of the signal by distributing a plurality of orthogonal carrier waves are also referred to as sub-carriers. 子载波是用于数据传输的数据子载波、用于同步的导频子载波、或者并不涉及直接传输但是用作帧的各个部分之间的过渡保护（transitionguard)的子载波中的任意一个。 Subcarriers are data subcarriers used for data transmission, for synchronizing the pilot sub-carrier, or it does not involve any direct transmission of a subcarrier transition Protection (transitionguard) between the respective portions of the frame used. 多个子载波可被集合成一个逻辑子信道。 A plurality of sub-carriers may be grouped into a logical subchannel. 存在许多不同的把子载波集合成信道的方式，例如把在子载波频带内分发的子载波用于分集信道，把相邻的子载波用于子带信道。 Many different sets of the sub-carrier composite channel exists in the way, for example to distribute the subcarriers of the subcarrier bands in a diversity channel, the adjacent subcarriers for subband channel. 在一些0FDM系统中，利用多个逻辑子信道传送0FDM符号。 0FDM In some systems, a plurality of logical subchannels 0FDM symbols transmitted. 0FDM符号中的子信道可用于不同的用途，例如传送有效负载数据，传送导频信号，传送信道估计信息，或者传送供DL和UL 传输之用的控制信息。 0FDM symbols subchannels can be used for different purposes, such as sending the payload data, a pilot signal transmission, transmission channel estimation information, or for transmitting control information for the DL and UL transmissions. 在一些实现中，依据单播和/或广播模式传送的0FDM符号在相同时隙中由不同的子信道传送。  In some implementations, 0FDM symbol based unicast and / or broadcast transmission modes transferred in the same time slot by different subchannels. 在一些实施例中，帧中的第一个0FDM符号包括和单播模式和广播模式有关的前同步码。  In some embodiments, the first frame includes a preamble symbol 0FDM and unicast mode and broadcast mode relevant. 在其它实施例中，前面的几个0FDM符号共同包括与单播模式和广播模式有关的前同步码。 In other embodiments, the first few 0FDM preamble symbol includes common unicast mode and broadcast mode relevant. 在一些实施例中，广播和单播传输模式部分分别具有它自己相应的前同步码。 In some embodiments, the broadcast and unicast transmission mode portion each having its own respective preamble. 导频信道、DL控制信道和DL业务信道可由帧的剩余0FDM符号传送。 Pilot channel, the remaining symbols 0FDM DL control channel and DL traffic channel frame may be transmitted. 在一些实施例中，帧的前同步码包括提供同步用训练信息的信道。  In some embodiments, the frame includes a preamble for synchronization channel providing training information. 在一些实施例中，存在向在BS的范围内的移动终端传送各种发射器相关信息的信道。  In some embodiments, the presence of the transmitter transmits various information to the mobile terminal within a channel of the BS. 在一些实施例中，该信道被称为广播控制信道（BCC)。 In some embodiments, the channel is called the Broadcast Control Channel (BCC). 在一些实现中，BCC可位于形成前同步码的OFDM符号内。 In some implementations, BCC can be located within an OFDM symbol forming the preamble. 在其它实现中，BCC位于不是前同步码的一部分，而是位于帧结构内的其它地方的OFDM符号中。 In other implementations, the BCC is not located in a preamble portion, but is located elsewhere in the frame structure of an OFDM symbol. 传送的信息的例子可包括（但不限于）：系统带宽标识， 小区/扇区ID;BS的天线配置；和传输模式划分信息。 Examples of information transmitted may include (but are not limited to): identification system bandwidth, cell / sector ID; BS antenna configuration; and the division information transmission mode. 在一些实施例中，BCC只被定期用于向移动终端传送信息。 In some embodiments, BCC is only used periodically transmit information to the mobile terminal. 例如，BCC可被包括在每一帧中，或者在每一批特定数目的帧中包括一个BCC。 For example, BCC can be included in each frame, or each batch comprising a BCC specific number of frames. 在一些实施例中，前同步码还包括移动终端用于确定广播控制信道（BCC)在前同步码中其它地方的位置的信息。  In some embodiments, the preamble of the mobile terminal further comprises means for determining a broadcast control channel (BCC) information in the preamble location elsewhere. 在移动终端接入网络之后，移动终端根据前同步码中的信息，确定BCC的位置。  After the mobile terminal accesses the network, the mobile information terminal according to the preamble, determining the position of the BCC. 根据BCC信息，移动终端随后获得特定于由移动终端目前所处小区或子网中的发射器使用的帧的传输模式划分的信息，以及其它信息。 The BCC information, information specific to the mobile terminal then frame transmission mode by the mobile terminal is currently located in the cell or the transmitter uses a subnet division, and other information obtained. 在一些实施例中，帧的划分产生包括单播模式部分和广播模式部分的标称帧结构。  In some embodiments, generating the division frame comprises a unicast mode portion and broadcast mode portion of the nominal frame structure. 在一些实施例中，广播模式部分被用于单播模式传输，不过广播模式的总长度被保持， 即，保持较长的保护时间，好像该符号是广播0FDM符号一样。 In some embodiments, the broadcast mode portion is used for transmitting unicast mode, broadcast mode but the total length is maintained, i.e., to maintain a longer period of protection, if the symbol is the same symbol 0FDM broadcast. 例如，当不存在要发送的广播模式0FDM符号时，广播模式部分可被用于发送单播模式0FDM符号。 For example, when there is no broadcast mode 0FDM symbol to be transmitted, broadcast mode portion may be used to send unicast mode 0FDM symbols. 在一些实施例中，可在广播模式部分中传送信令信道和导频信道用于单播模式。 In some embodiments, the signaling channels may be transmitted in a broadcast mode and a guide portion for unicast pilot channel mode. 但是，为单播模式传输提供的帧的各个部分不能被用于多小区广播模式传输，因为由于循环前缀，或者更一般地说广播模式和单播模式的保护时间的相应大小的缘故，广播模式0FDM符号的持续时间大于单播模式0FDM符号的持续时间。 However, each part of the frame is a unicast mode transmission can not be provided for multi-cell broadcast mode transmissions, since the size of the guard time due to the corresponding cyclic prefix, or more generally broadcast mode and unicast mode reason, broadcast mode 0FDM symbol duration greater than the duration of the unicast mode 0FDM symbol. 在多小区中，在不延长帧的情况下，广播模式下0FDM符号的持续时间太长，以至不能归入单播模式0FDM符号持续时间中。 In a multi-cell, without extending frame, the duration of the broadcast mode 0FDM symbols long, as well as the unicast mode can not be classified 0FDM symbol duration. 如果缩短循环前缀，那么在连续0FDM符号之间将不能有效减轻ISI。 If shortened cyclic prefix, 0FDM between successive symbols will not effectively reduce ISI. 在一些实施例中，为单播模式传输提供的帧的各个部分可被用于单小区广播传输，因为在单小区广播内，不存在要关注的传播延迟。 In some embodiments, various portions of the frame is a unicast mode transmission can be provided for single-cell broadcast transmission, since a single-cell broadcast, there is no concern for the propagation delay. 在一些实施例中，具有不同帧划分的各个帧结构可用于利用广播模式和/或单播模式传送0FDM符号。  In some embodiments, each frame is divided with different frame structures may be used to transmit 0FDM symbol using the broadcast mode and / or unicast mode. 每个帧结构具有用于识别选择的帧结构的特定标识符。 Each frame structure having a specific identifier for identifying a frame structure selection. 例如，帧结构标识符可以是分配给相应帧结构的预定比特数的多个二进制数之一。 For example, the frame structure identifier may be assigned to one of a plurality of binary numbers corresponding to a predetermined number of bits of the frame structure. 在一些实施例中，关于BCC的传输模式规定信息可以采取帧结构标识符的形式。 In some embodiments, the transmission mode BCC on predetermined information identifier may take the form of a frame structure. 更一般地说，接收包含多个0FDM符号的帧的方法包括：接入发送该帧的通信网络；根据接收帧的至少一个0FDM符号中的信息，识别包括传输模式标识符在内的系统参数；和按照与传输模式标识符相关的帧结构，接收在第一0FDM符号之后的0FDM符号。 Method  More generally, a frame comprising a plurality of receiving 0FDM symbols comprising: an access network transmits the communication frame; 0FDM at least one symbol according to the information in the received frame, the identifier identifying the transmission mode comprising including system parameters; and a transmission mode in accordance with a frame structure identifier, received after the first symbol 0FDM 0FDM symbol. 传输模式标识符指示帧中按照单播模式传送的0FDM符号和按照广播模式传送的0FDM符号之间的边界的位置。 Transmission pattern identifier 0FDM position of the boundary between the symbols indicate the frame transmitted in a unicast mode and a symbol transmitted according 0FDM broadcast mode. 上面关于图1说明了例证的通信网络。  FIG. 1 explained above with respect to examples of the communication network. 图15表示按照本发明的一个实施例的通信网络1500的另一例子。 FIG 15 shows another example embodiment of a communication network 1500 according to an embodiment of the present invention. 多个相邻的电信小区1510被用于覆盖一个地理区域。 A plurality of adjacent cells 1510 is used to cover telecommunications a geographic area. 每个小区1510用六边形表示，诸如BS之类的发射器1520位于小区1510的中心。 Each cell 1510 represented by the hexagons, BS 1520 such as transmitter 1510 in the center of the cell. 发射器能够支持单小区单播模式传输，单小区广播模式传输和多小区广播传输。 The transmitter is capable of supporting single-cell unicast mode transmission, the single-cell broadcast mode transmissions and multi-cell broadcast transmission. 还从小区1510中的BS1520 的中心位置开始沿径向把每个小区1510分成三个基本相等的部分1512、1514、1516。 Position further from the center of the cell 1510 BS1520 radially to each cell 1510 is divided into three substantially equal parts 1512,1514,1516. 移动终端1530位于第一小区1510A中。  The mobile terminal 1530 is located in a first cell 1510A. 小区1510A被分成三个基本相等的部分1512A、1514A、1516A。 Cell 1510A is divided into three substantially equal parts 1512A, 1514A, 1516A. 相邻的小区邻接部分1512A的每个外部小区边缘。 Adjacent cells adjacent to each outer edge of the cell portion 1512A. 第二小区1510B 的部分1516B与第一小区1510A的部分1512A接壤，第三小区1510C的部分1514C与第一小区1510A的部分1512A接壤。 A second cell portion 1510B 1516B 1510A of the first cell 1512A border portion, third portion 1514C 1510C cell borders portion 1510A of the first cell 1512A. 小区1510A、1510B、1510C的三个接壤部分1512A、1516B、 1514C形成整个一组小区的总通信网络内的第一子网1551。 Cell 1510A, 1510B, 1510C three borders portions 1512A, 1516B, 1514C formed within a first subnet 1551 total communications network entire group of cells. 子网是形成网络的多个同步BS，所形成的网络使用少于整个通信网络中BS的总数的BS。 A subnet is a plurality of synchronized BS networks using the network formed is less than the total number of the whole communication network BS in the BS. 在一些实施例中，不同的子网被用于传送不同的内容。 In some embodiments, different subnets are used to transmit different content. 图15中还表示了由通信网络1500中的小区的多个部分形成的其它子网1552、1553、1554、1555、1556、1557。 FIG 15 also shows another subnet formed by a plurality of portions of cells in the communication network 1500 1552,1553,1554,1555,1556,1557. 在一些实施例中，当在BS1520A的清楚接收范围内时，移动终端1530接收来自BS 1520A的单播模式传输。  In some embodiments, when the reception range BS1520A apparent, the mobile terminal 1530 receives the unicast mode transmission from the BS 1520A. 当移动终端1530接近小区1510A的边缘时，移动终端150可能接收来自BS1520B或1520C的单播模式传输，取决于与自BS1520A的接收相比，移动终端1530是否具有自BS1520B、1520C任何一个的更好接收。 When the mobile terminal 1530 is near the edge of cell 1510A, the mobile terminal 150 may receive unicast mode transmission from BS1520B or 1520C, depending from BS1520A compared with receiving, from the mobile terminal whether BS1520B 1530, better 1520C to any one of receive. 在一些实施例中，移动终端1530从在移动终端1530位于的子网中广播的所有BS 接收广播模式传输。  In some embodiments, the mobile terminal 1530 receives transmissions from a broadcast mode to all BS broadcast subnet located in the mobile terminal 1530. 在图15的例子中，第一子网中的BS的数目为3:BS1520A;BS1520B 和BS1520C。 In the example of FIG. 15, the number of the first subnet to the BS 3: BS1520A; BS1520B and BS1520C. 由于在到达移动终端1530时，出自每个BS的传输能够行进的多条路径的缘故，用于广播模式传输的循环前缀比用于单播模式传输的循环前缀长。 Since the arrival of the mobile terminal 1530, because of multiple paths by each BS transmissions can travel, a cyclic prefix for broadcast mode transmissions than the cyclic prefix length for unicast mode transmission. 在图15中，子网被表示成由三个相邻小区的单一部分形成，但是子网显然可以更大，例如由一组多个相邻的小区和与所述一组多个相邻小区的边缘相邻和邻接的小区的各个部分形成。  In FIG. 15, is represented as a single sub-part is formed by the three adjacent cells, it is clear that a subnet may be larger, by a plurality of a group of adjacent cells and a set of the plurality of e.g. and the adjacent edges of neighboring cells adjacent to each cell forming portion. 在一些实施例中，子网越大，那么当使用广播模式时传送的0FDM符号的循环前缀就越长。 In some embodiments, the larger subnet, then the longer cyclic prefix of the symbol when used 0FDM broadcast mode transmission. 此外，虽然小区1510被表示成分为三个基本相同的部分。  In addition, although the cell 1510 is represented as a three component substantially same parts. 不过小区显然可被分成大于或小于三个部分，并且各个部分的大小可能并不基本相同。 But apparently the cell may be divided into more or less than three parts, and the size of each part may not be substantially the same. 在一些实施例中，小区被分成的各个部分的数目和大小取决于用于在这些部分中传送0FDM符号的BS的天线。 In some embodiments, the cell is divided into a number and size of each part depends 0FDM for transmitting symbols in these portions of the BS antenna. 更一般地说，小区的各个部分的数目和大小是特定于实现的参数。 More generally, the number and size of various parts of the cell parameter is implementation specific. 图15中的小区1510还被表示成大小都相同。 Cell 1510. FIG. 15 is also shown as the same size. 在一些实施例中，小区在大小方面有差异。 In some embodiments, there are differences in cell size. 在一些实现中，用于在特定子网中进行传送的所有发射器的帧结构对由所有发射器同时传送的每个相应帧来说是相同的。 All the frame structure of the transmitter  In some implementations, in particular for the transfer of each respective subnet by a frame is transmitted while all transmitters is the same. 在一些实现中，使各个子网的每个发射器进行的每一帧的传输同步，以便同时发生。  In some implementations, each emitter of each subnet will be transmitted every frame synchronized to occur simultaneously. 在一些实施例中，与从其中的每个BS传送相同传输的单一较大网络相反，使多个子网同步以在每个子网内广播相同的传输。  In some embodiments, a single larger network transmits the same transmission from each BS which is opposite to the plurality of subnets synchronized to the same broadcast transmission within each subnet. 与单一的较大网络的循环前缀的持续时间相比，通过利用同步的多个子网，循环前缀的持续时间可被降至最小。 Compared to a single cyclic prefix duration of a larger network, by using a plurality of sub-synchronous, cyclic prefix duration can be minimized. 在多个子网中的每个子网中，对子网中的每个BS传送的每一帧，保持广播模式0FDM符号与单播模式0FDM符号的比率。 In each subnet in the plurality of subnets, each subnet of each frame transmitted by the BS, retaining the ratio 0FDM broadcast mode and unicast mode symbol 0FDM symbols. 在一些实施例中，通过把不同的扰码和不同的子信道配置用于传输，传送相同的内容的多个子网减轻由相邻的子网传送的相同内容的传播或多径延迟的干扰。 In some embodiments, by different scrambling codes and different sub-channels configured to transmit, transmitting the same content to multiple subnets reduction or multipath propagation of the same content by the adjacent sub-transmission delay interference. 在一些实现中， 诸如干扰消除和/或软合并之类的技术可被用于改进位于子网边缘的移动终端的接收。 In some implementations, such as interference cancellation and / or soft combining such techniques it can be used to improve the receiving mobile terminal located in the edge subnet. 在一些实施例中，当退出一个子网并进入另一子网时，进行切换。  In some embodiments, when exiting a subnet into another subnet and performs switching. 在一些实施例中，在子网之间的边界进行接收信号的软合并。 In some embodiments, the soft combining of the received signal at the boundary between the subnet. 在一些实施例中，子网标识符被用于识别哪些BS被包括在特定的子网中。  In some embodiments, the subnet identifier for identifying which BS is included in a particular subnet. 在本发明的一些实施例中，为MMO-OFDM通信提供包括广播模式和单播模式共存，以保持相同的采样频率和相同的FFT大小的系统和方法。  In some embodiments of the present invention, the MMO-OFDM communication is providing a broadcast mode and unicast mode coexist, to keep the system and method of the same sampling frequency and same FFT size. 在本发明的一些实施例中，为变换OFDM(T-0FDM)通信提供包括广播模式和单播模式共存，以保持相同的采样频率和相同的FFT大小的系统和方法。  In some embodiments of the present invention, the transform OFDM (T-0FDM) providing communication includes a broadcast mode and unicast mode coexist, to keep the system and method of the same sampling frequency and same FFT size. 在2006年3月30日提交的PCT专利申请No. (代理人案卷编号71493-1366)中更详细地说明了T-0FDM，该PCT 专利申请被转让给本申请的同一受让人，因此整体引为参考。 PCT patent in 2006, March 30 filed No. (Attorney Docket No. 71493-1366) T-0FDM is described in more detail in the PCT patent application is assigned to the same assignee of the present application, so the overall incorporated by reference. 在本发明的一些实施例中，为MMO-OFDM和/或T-0FDM通信提供包括支持现有的UMTSTTI的频分双工（FDD)帧结构的系统和方法。  In some embodiments of the present invention, there is provided a system and method for supporting a frame structure comprising UMTSTTI conventional frequency division duplex (FDD) for the MMO-OFDM and / or T-0FDM communication. 在一些实施例中，提供支持时分双工(TDD)的帧结构。 In some embodiments, there is provided a frame structure supports a time division duplex (TDD) is. 在本发明的一些实施例中，为MM0-0FDM通信提供可根据UMTS码片率获得采样频率的系统和方法。  In some embodiments of the present invention, a system and method may be obtained according to the sampling frequency for the UMTS chip rate MM0-0FDM communication. 在本发明的一些实施例中，为MM0-0FDM通信提供支持从所有BS的统一传输的系统和方法。  In some embodiments of the present invention, there is provided a system and method for the uniform transmission of all the BS MM0-0FDM support for communication. 在本发明的一些实施例中，为MM0-0FDM通信提供包括更大的（当与单播模式相比时）的保护间隔，以容忍更长的多径延迟的系统和方法。  In some embodiments of the present invention, providing a larger (when compared to unicast mode) communication MM0-0FDM guard interval, a system and method to tolerate longer multipath delay. 在本发明的一些实施例中，为MM0-0FDM通信提供能够在广播模式和单播模式之间切换的系统和方法。  In some embodiments of the present invention, a system and method capable of switching between broadcast mode and unicast mode MM0-0FDM communication. 在本发明的一些实施例中，为MM0-0FDM通信提供其中发射器可以是基于组的广播模式，而不要求更长的前缀和/或更密集的导频的系统和方法。  In some embodiments of the present invention, there is provided wherein the transmitter is MM0-0FDM broadcast mode communication may be based on the group, without requiring longer prefix / or more intensive systems and methods pilots. 按照本发明的一个实施例，发射器是基站。 According to an embodiment of the present invention, the transmitter is a base station. 在本发明的一些实施例中，为MMO-OFDM通信提供支持灵活的时隙定义的系统和方法。  In some embodiments of the present invention, there is provided a flexible support slot definition system and method for the MMO-OFDM communication. 在本发明的一些实施例中，提供用于改进的广播模式的0FDM子载波排列。  In some embodiments of the present invention, there is provided an improved subcarrier permutation 0FDM broadcast mode. 为了提供供通信系统之用的本发明的实施例的环境，图1表示了控制多个小区12 内的无线通信的基站控制器（BSC) 10,所述小区12由对应的基站（BS) 14服务。  In order to provide for the use of the communication system environment in which embodiments of the present invention, Figure 1 shows a base station controller controlling a plurality of cells (BSC) in the radio communication 1210, the cell 12 by a corresponding base station ( BS) 14 service. 一般来说， 每个基站14便利与位于和对应基站14关联的小区12内的移动和/或无线终端16的0FDM 通信。 In general, a convenient cell 14 associated with each corresponding base station and the base station 14 located 0FDM mobile communication and / or wireless terminals 12, 16 within. 移动终端16相对于基站14的移动导致信道条件的显著波动。 The mobile terminal 16 with respect to the base stations 14 results in significant fluctuation in channel conditions. 如图所示，基站14和移动终端16可包括为通信提供空间分集的多个天线。 As shown, the base station 14 and mobile terminals 16 may include multiple antennas to provide spatial diversity communication. 在深入研究优选实施例的结构和功能细节之前，提供可在其上实现本发明的各个方面的移动终端16和基站14的尚级概述。  Before delving into the details of the structure and function of a preferred embodiment, provides an overview of the implementation of the invention in which the various aspects of the mobile terminal 16 and base station 14 is still level. 参见图2,图中图解说明了基站14。 Referring to Figure 2, there is illustrated the base station 14. 基站14 一般包括控制系统20,基带处理器22,发射电路24,接收电路26,多个天线28和网络接口30。 The base station 14 generally includes a control system 20, a baseband processor 22, transmit circuitry 24, receive circuitry 26, multiple antennas 28, and a network interface 30. 接收电路26从移动终端16(图1中图解说明）提供的一个或多个远程发射器接收带有信息的射频信号。 One or more remote transmitters circuit 26 receives from the mobile terminal 16 (illustrated in FIG. 1) provided with information receiving RF signals. 低噪声放大器和滤波器（未示出）协同放大所述信号，并从所述信号中除去宽带干扰以便处理。 A low noise amplifier and a filter (not shown) amplifies the signal synergistic, and remove broadband interference from the signal for processing. 下变频和数字化电路（未示出）随后把滤波后的接收信号下变频成中频或基频信号，所述中频或基频信号随后被数字化成一个或多个数字流。 Downconversion and digitization circuitry (not shown) and then the filtered, received signal to an intermediate frequency or baseband frequency signal, the intermediate frequency or baseband frequency signal is then digitized into one or more digital streams. 基带处理器22处理数字化的接收信号，以提取在接收信号中传送的信息或数据比特。  processes the digitized received signal baseband processor 22 to extract the transmitted information in the received signal or data bits. 这种处理一般包括解调、解码和纠错操作。 Such processing typically comprises demodulation, decoding, and error correction operations. 因而，通常用一个或多个数字信号处理器(DSP)或者专用集成电路（ASIC)实现基带处理器22。 Accordingly, the baseband processor 22 is generally implemented in one or more digital signal processors (DSP) or application specific integrated circuit (ASIC). 接收的信息随后通过网络接口30被发到无线网络的另一边，或者被传送给由基站14服务的另一移动终端16。 Received information is then sent through the network interface 30 to the other side of the wireless network, or transmitted to another mobile terminal 16 by the base station 14 and services. 在发射方，基带处理器22从受控制系统20控制的网络接口接收表示语音、数据或控制信息的数字化数据，并对所述数据编码以便传输。  In the transmitting side, the baseband processor 22 from the network by the control system 20 controls the interface receiving a voice, data, or control information of the digital data, and encode the data for transmission. 编码数据被输出给发射电路24,在发射电路24,编码数据由具有所需发射频率的载波信号调制。 The encoded data is output to the transmit circuitry 24, the transmitter circuit 24, the coded data modulated transmission carrier signal having a desired frequency. 功率放大器（未示出）将把调制的载波信号放大到适合于传输的电平，并通过匹配网络（未示出）把调制的载波信号传递给天线28。 A power amplifier (not shown) will be modulated carrier signals to a level suitable for transmission, and transmitting the modulated carrier signal to the antennas 28 through a matching network (not shown). 本领域的技术人员可以采用的各种调制和处理技术被用于基站和移动终端之间的信号传输。 Various modulation and processing techniques skilled in the art may be employed for signal transmission between a base station and a mobile terminal. 参见图3,图中图解说明了按照本发明的一个实施例配置的移动终端16。  Referring to Figure 3, there is illustrated a mobile terminal configured in accordance with one embodiment of the present invention 16. 类似于基站14,移动终端16包括控制系统32,基带处理器34,发射电路36,接收电路38,多个天线40和用户接口电路42。 14 is similar to the base station, the mobile terminal 16 includes a control system 32, a baseband processor 34, transmit circuitry 36, receive circuitry 38, multiple antennas 40, and user interface circuitry 42. 接收电路38从一个或多个基站14接收带有信息的射频信号。 Receive circuitry 38 receives radio frequency signals with information from one or more base stations 14. 低噪声放大器和滤波器（未示出）协同放大所述信号，并从所述信号中除去宽带干扰以便处理。 A low noise amplifier and a filter (not shown) amplifies the signal synergistic, and remove broadband interference from the signal for processing. 下变频和数字化电路（未示出）随后把滤波后的接收信号下变频成中频或基频信号， 所述中频或基频信号随后被数字化成一个或多个数字流。 Downconversion and digitization circuitry (not shown) and then the filtered, received signal to an intermediate frequency or baseband frequency signal, the intermediate frequency or baseband frequency signal is then digitized into one or more digital streams. 基带处理器34处理数字化的接收信号，以提取在接收信号中传送的信息或数据比特。  34 processes the digitized received signal to baseband, to extract the transmitted information in the received signal or data bits. 这种处理一般包括解调、解码和纠错操作。 Such processing typically comprises demodulation, decoding, and error correction operations. 通常用一个或多个数字信号处理器（DSP) 或者专用集成电路（ASIC)实现基带处理器34。 The baseband processor 34 is generally implemented in one or more digital signal processors (DSP) or application specific integrated circuit (ASIC). 对于传输来说，基带处理器34从控制系统32接收表示语音、数据或控制信息的数字化数据，并对所述数据编码以便传输。  For transmission, the baseband processor 34 receives a voice, data, or control information of the digital data from the control system 32, and encode the data for transmission. 编码数据被输出给发射电路36,在发射电路36,它被调制器用来调制具有所需发射频率的载波信号。 The encoded data is outputted to the transmission circuit 36, a carrier signal having a desired transmission frequency in the transmission circuit 36, which is used to modulate the modulator. 功率放大器（未示出）将把调制的载波信号放大到适合于传输的电平，并通过匹配网络（未示出）把调制的载波信号传递给天线40。 A power amplifier (not shown) will be modulated carrier signals to a level suitable for transmission, and transmitting the modulated carrier signal to the antennas 40 through a matching network (not shown). 本领域的技术人员可以采用的各种调制和处理技术被用于移动终端和基站之间的信号传输。 Various modulation and processing techniques skilled in the art may be employed for signal transmission between the mobile terminal and the base station. 在0FDM调制中，传输频带被分成多个正交载波。  In 0FDM modulation, the transmission band is divided into a plurality of orthogonal carriers. 每个载波按照待传送的数字数据被调制。 Each carrier is modulated according to the digital data to be transmitted. 由于0FDM把传输频带分成多个载波，因此每个载波的带宽减小，每个载波的调制时间增大。 0FDM Since the transmission band is divided into multiple carriers, the bandwidth per carrier decreases, the modulation time per carrier increases. 由于多个载波被并行传送，因此与当使用单一载波时相比，任意指定载波上的数字数据或符号的传输速率较低。 Since the multiple carriers are transmitted in parallel, so compared to when using a single carrier, arbitrarily assigned a lower transmission rate of the digital data, or symbols on a carrier. 0FDM调制利用关于待传送信息的反向快速傅里叶变换（IFFT)的性能。  0FDM modulation using inverse fast Fourier transform on performance (IFFT) of information to be transmitted. 对于解调来说，关于接收信号的快速傅里叶变换（FFT)的性能恢复传送的信息。 For demodulation, the performance with respect to a fast Fourier transform (FFT) of the received signal to recover the information transmitted. 实践中，IFFT和FFT 分别由进行反向离散傅里叶变换（IDFT)和离散傅里叶变换（DFT)的数字信号处理提供。 In practice, IFFT and FFT are provided by a reverse discrete Fourier transform (IDFT) and a digital signal processing discrete Fourier transform (DFT) is provided. 因此，0FDM的表征特征在于为传输信道内的多个频带产生正交载波。 Accordingly, the characterizing feature in that 0FDM generating a plurality of orthogonal carrier waves in the transmission channel band. 调制信号是具有较低传输速率，并且能够保持在它们各自的频带内的数字信号。 Modulated signal having a lower transmission rate, and the digital signal can be held within their respective bands. 单独的载波并不直接由数字信号调制。 A separate carrier not modulated directly by the digital signals. 相反，所有的载波由IFFT处理同时调制。 Instead, all the carriers are modulated by the IFFT processing. 操作上，0FDM最好至少用于从基站14到移动终端16的下行链路传输。  Operation, 0FDM preferably for at least downlink transmission from the base station 14 to the mobile terminal 16. 每个基站14配有"η"个发射天线28,每个移动终端16配有"m"个接收天线。 Each base station 14 is equipped with "η" transmit antennas 28, each mobile terminal 16 is equipped with "m" receive antennas. 特别地，通过利用适当的双工器或开关，各个天线可被用于接收和发射，只是为了清楚起见而如此标记各个天线。 In particular, by using appropriate duplexers or switches, each antenna may be for receiving and transmitting, for clarity only so labeled respective antenna. 参考图4,说明逻辑0FDM传输体系结构。  Referring to FIG. 4, a logical transmission architecture 0FDM. 首先，基站控制器10将把待发射给各个移动终端16的数据发给基站14。 First, the base station controller 10 will be transmitted to each mobile terminal 16 of the data sent to the base station 14. 基站14可使用与移动终端关联的信道质量指示符（CQI) 来调度供传输的数据，以及选择适当的编码和调制来传送调度数据。 The base station 14 may use channel quality indicator (CQI) associated with the mobile terminals to schedule the data for transmission, and select the appropriate coding and modulation for transmitting scheduled data. CQI可直接来自于移动终端16,或者可在基站14根据移动终端16提供的信息来确定。 CQI may be directly from the mobile terminal 16, or may be determined at the base station 14 to the mobile terminal 16 based on the information provided. 在任何一种情况下，每个移动终端16的CQI是信道幅度（或响应）在0FDM频带内的变化程度的函数。 In either case, the CQI for each mobile terminal 16 is the channel amplitude (or response) the degree of change in the frequency band 0FDM function. 利用数据加扰逻辑46,按照降低与数据相关的峰值与平均功率比的方式加扰调度数据44 (它是比特流）。  using data scrambling logic 46. The data-related manner to reduce peak to average power ratio of scheduling data scrambler 44 (which is a bit stream). 利用CRC增加逻辑48确定加扰数据的循环冗余校验并将其附到加扰数据上。 Increased using the CRC logic 48 determines a cyclic redundancy check scrambled data and attach it to the scrambled data. 随后，利用信道编码器逻辑50进行信道编码，以便有效地向数据中加入冗余，从而便利在移动终端16的恢复和纠错。 Subsequently, the channel encoder logic 50 performs channel coding, redundancy is added in order to effectively data so as to facilitate recovery and error correction at the mobile terminal 16. 关于特定移动终端16的信道编码同样基于CQI。 The channel coding for a particular mobile terminal 16 is also based on the CQI. 在一些实现中，信道编码器逻辑50使用已知的Turbo编码技术。 In some implementations, the channel encoder logic 50 uses known Turbo encoding techniques. 编码数据随后由速率匹配逻辑52处理，以补偿与编码关联的数据扩展。 Encoded data is then processed by rate matching logic 52 to compensate for the data expansion associated with encoding. 位元交错器逻辑54系统地重新排列编码数据中的位元，以使连续数据位的丢失降至最少。  Bit interleaver logic 54 systematically rearranges encoded data bits so that the loss of consecutive data bits minimum. 所得到的数据位由映射逻辑56系统地映射成随选择的基带调制而定的对应符号。 The 56 resulting data bits are systematically mapped into the mapping logic with the chosen baseband modulation corresponding to the predetermined symbol. 最好使用正交调幅（QAM)或正交相移键控（QPSK)调制。 Preferably using quadrature amplitude modulation (QAM) or quadrature phase shift keying (QPSK) modulation. 最好根据特定移动终端的CQI 选择调制度。 The best choice of modulation of the CQI for the particular mobile terminal. 可利用符号交错器逻辑58系统地重新排列符号，以便进一步支持发射信号对由频率选择性衰减引起的周期数据丢失的免疫性。 Available symbol interleaver logic 58 systematically rearranged symbols, in order to further support the periodic emission signal caused by frequency selective attenuation data loss immunity. 此时，各组位元已被映射成代表幅度和相位星座中的位置的符号。  In this case, each group of bits have been mapped into a symbol representing the amplitude and phase constellation position. 当需要空间分集时，各块符号随后由空时块码（STC)编码器逻辑60处理，STC编码器逻辑60按照使发射的信号更抗干扰，并且在移动终端16更易于解码的方式修改符号。 When spatial diversity is desired, each block symbols are then (STC) encoder logic 60, the STC encoder logic 60 change symbols in accordance with a signal transmitted more interference, and the mobile terminal 16 more easily decoded manner by a space-time block code . STC编码器逻辑60将处理输入的符号，并提供与基站14的发射天线28的数目对应的"η"个输出。 STC encoder logic 60 will process the input symbol, and provides a number of transmit antennas 28 corresponding to the base station 14 "η" and outputs. 如上关于图2 说明的控制系统20和/或基带处理器22将提供映射控制信号来控制STC编码。 Described above with respect to FIG. 2, the control system 20 and / or baseband processor 22 will provide a mapping control signal to control STC encoding. 此时，假定"η"个输出的符号代表待发射的数据，并且能够被移动终端16恢复。 In this case, assuming that "η" symbol represents output data to be transmitted, and the mobile terminal 16 can be restored. 对于本例来说，假定基站14具有两个天线28(η= 2)，并且STC编码器逻辑60提供符号的两个输出流。  For this example, assume the base station 14 has two antennas 28 (η = 2), and the STC encoder logic 60 provides two output streams of symbols. 因此，STC编码器逻辑60输出的每个符号流被发送给对应的IFFT 处理器62,图中分别图解说明以便于理解。 Thus, each of the symbol streams output by the STC encoder logic 60 is sent to a corresponding IFFT processor 62, illustrated separately in FIG facilitate understanding. 本领域的技术人员会认识到一个或多个处理器可被用于单独或者与这里说明的其它处理结合地提供这样的数字信号处理。 Those skilled in the art will recognize that one or more processors may be used alone or in combination with other processing described herein in combination to provide such digital signal processing. IFFT处理器62最好作用于各个符号，以提供反向傅里叶变换。 IFFT processor 62 is preferably applied to the respective symbols to provide an inverse Fourier Transform. IFFT处理器62的输出提供时域中的符号。 Output of the IFFT processors 62 provides symbols in the time domain. 时域符号被分成多个帧，所述多个帧由前缀插入逻辑64与前缀联系起来。 Time domain symbols are divided into a plurality of frames, said plurality of frames by the prefix insertion logic 64 linked with the prefix. 通过对应的数字上变频（DUC)和数-模（D/A)转换电路66,每个所得到的信号在数字域中被上变频成中频信号并被转换成模拟信号。 Through the frequency (the DUC) and digital on the corresponding digital - analog (D / A) conversion circuit 66, each of the resulting signal is up-converted into an intermediate frequency signal is converted to an analog signal in the digital domain. 得到的（模拟）信号随后由RF电路68和天线68同时在所需的RF频率调制、放大和发射。 Resultant (analog) signals are then simultaneously modulated at the desired RF frequency, amplified, and transmitted by the RF circuitry 68 and antenna 68. 特别地，预定的移动终端16已知的导频信号分散在子载波间。 In particular, the mobile terminal 16 a predetermined known pilot signal is dispersed between subcarriers. 下面详细讨论的移动终端16将把导频信号用于信道估计。 The mobile terminal 16 will be discussed in detail below pilot signal for channel estimation. 现在参见图5,举例说明移动终端16对传送信号的接收。  Referring now to FIG. 5, of accepting 16 illustrates a transmission signal of mobile terminals. 当发射的信号到达移动终端16的每个天线40时，相应的信号由对应的RF电路70解调和放大。 When the signal reaches the transmitting antenna 16 of each mobile terminal 40, the respective signals amplified by the RF and demodulation circuit 70 corresponds. 为了简明和清楚起见，只详细描述和图解说明两条接收路径之一。 For simplicity and clarity, only one is described and illustrated in detail two receive paths is described. 模-数（A/D)转换器和下变频电路72数字化和下变频模拟信号，以便进行数字处理。 Analog - digital (A / D) converter and down-conversion circuitry 72 and digital-conversion analog signal for digital processing. 所得到的数字化信号可被自动增益控制电路(AGC) 74用于根据接收的信号电平，控制RF电路70中的放大器的增益。 The digitized signal can be obtained an automatic gain control circuit (AGC) 74 for the received signal level, the gain control amplifier 70 in the RF circuitry. 首先，数字化信号被提供给同步逻辑76,同步逻辑76包括粗同步逻辑78,粗同步逻辑78缓冲几个0FDM符号，并计算两个连续0FDM符号之间的自相关。  First, the digitized signal is provided to synchronization logic 76, the synchronization logic 76 auto-correlation between two symbols comprising successive 0FDM coarse synchronization logic 78, the coarse synchronization logic 78 0FDM buffer several symbols, and calculate. 所得到的与相关结果的最大值对应的时间索引确定精同步搜索窗，精同步逻辑80使用精同步搜索窗根据报头确定精确的成帧起始位置。 The results obtained with the maximum correlation corresponding to the time index to determine a fine synchronization search window, use the fine synchronization logic 80 determines a fine synchronization search window precise framing starting position based on the header. 精同步逻辑80的输出便利帧对准逻辑84的帧采集。 Facilitate the fine synchronization logic output frame alignment logic 80 of the frame 84 of the collection. 恰当的帧对准是重要的，从而后续的FFT处理提供从时域到频域的精确变换。 Proper frame alignment is important so that subsequent FFT processing provides an accurate conversion from the time domain to the frequency domain. 精同步算法以报头携带的接收导频信号和已知导频数据的本地副本之间的相关性为基础。 Received pilot fine synchronization algorithm is carried by the headers and a known pilot signal based on pilot correlation between the local copy of the data. 一旦获得帧对准， 0FDM符号的前缀就由前缀去除逻辑86除去，所得到的样本被发给频率偏移校正逻辑88,频率偏移校正逻辑88补偿由发射器和接收器中不匹配的本地振荡器引起的系统频率偏移。 Once frame alignment, the prefix will be removed by the symbol 0FDM prefix removal logic 86, the resultant samples are sent to frequency offset correction logic 88, a local frequency offset correction logic 88 does not match the compensation by the transmitter and the receiver system frequency offset caused by the oscillator. 最好，同步逻辑76包括频率偏移和时钟估计逻辑82,所述频率偏移和时钟估计逻辑82以报头为基础，以帮助估计对发射信号的影响，并把这些估计结果提供给校正逻辑88,从而恰当地处理OFDM符号。 Preferably, the synchronization logic 76 includes frequency offset and clock estimation logic 82, the frequency offset and clock estimation logic 82 based on the header to help estimate the impact on the transmit signal, and these estimates result to the correction logic 88 to properly process OFDM symbols. 此时，时域中的0FDM符号随时可以通过利用FFT处理逻辑90,变换到频域中。  At this time, any time 0FDM symbols in the time domain by using FFT processing logic 90, transformed into the frequency domain. 结果是频域符号，所述频域符号被发给处理逻辑92。 The results are frequency domain symbols, the frequency-domain symbols are sent to processing logic 92. 处理逻辑92利用分散导频提取逻辑94 提取分散的导频信号，利用信道估计逻辑96根据提取的导频信号确定信道估计，并利用信道重构逻辑98提供所有子载波的信道响应。 The processing logic 92 using scattered pilot extraction logic 94 extracts the scattered pilot signal using channel estimation logic 96 a channel estimate extracted pilot signal is determined in accordance with, and using the channel channel reconstruction logic 98. In all the sub-carriers in response. 为了确定每个子载波的信道响应，导频信号本质上是在时间和频率方面，按照已知的模式（pattern)分散在整个0FDM子载波内的数据符号之间的多个导频符号。 In order to determine a channel response for each subcarrier, the pilot signal is essentially in time and frequency, according to a known pattern (pattern) dispersing a plurality of pilot symbols between data symbols throughout the 0FDM subcarriers. 在转让给本申请的相同受让人的PCT专利申请No.PCT/ CA2005/000387(申请日2005年3月15日）中可找到在OFDM环境中，在指定的时间和频率图中，导频符号在可用子载波之间的分散的例子。 PCT Patent Application No.PCT assigned to the same assignee of the present application / CA2005 / 000387 (March 15, 2005 filing date) may be found in an OFDM environment, at the specified time and frequency diagram, the pilot examples of the dispersing symbols among available sub-carriers. 继续参考图5,处理逻辑比较接收的导频符号和在某些时间的某些子载波中预期的导频符号，以确定其中传送导频符号的子载波的信道响应。 With continued reference to FIG. 5, the processing logic compares the received pilot symbols and in certain sub-carriers at certain times of the expected pilot symbol, to determine which transmitted symbol is a pilot subcarrier channel response. 结果被内插，以估计未被设置导频符号的大多数（即使不是全部）剩余子载波的信道响应。 The results are interpolated to estimate a pilot symbol is not disposed most (if not all) of the channels in response to the remaining subcarriers. 实际的和内插的信道响应被用于估计总的信道响应，所述总的信道响应包括0FDM信道中的大多数（即使不是全部）子载波的信道响应。 The actual and interpolated channel responses are used to estimate the overall channel response of the overall channel response comprising a channel 0FDM most (if not all) sub-carrier channel response. 从每个接收路径的信道响应得到的频域符号和信道重构信息被提供给STC解码器100,STC解码器100提供对这两个接收路径的STC解码，从而恢复发射的符号。  reconstruction information is provided to an STC decoder 100, these STC decoder 100 provides STC decoding the two received paths to recover the transmitted symbols in response to the frequency-domain symbols and channel obtained from the channel for each receive path. 信道重构信息向STC解码器100提供当处理相应的频域符号时，足以消除传输信道的影响的均衡信息。 When channel reconstruction information to the decoder is provided when the STC 100 processes a respective frequency domain symbols, sufficient to eliminate the effects of the transmission channel equalization information. 利用与发射器的符号交错器逻辑58对应的符号解交错器逻辑102,恢复的符号的顺序被复原。  using symbol interleaver logic 58 of the transmitter and the corresponding symbol de-interleaver logic 102, restoring the sequence of symbols is restored. 随后利用去映射逻辑104把去交错的符号解调或去映射成对应的位流。 It is then used to demodulate the symbol mapping logic 104 to deinterleaving or mapped to a corresponding bitstream. 位元随后由与发射器体系结构的位元交错器逻辑54对应的位元解交错器逻辑106解交错，解交错的位元随后由解速率匹配逻辑108处理，并被提供给信道解码器逻辑110,以恢复初始加扰的数据和CRC校验和。 Followed by a bit interleaved bit interleaver logic 54 of the transmitter architecture corresponding bit deinterleaver logic 106 solution, followed by deinterleaving the bit rate de-matching logic 108 by the processing, and is supplied to channel decoder logic 110 to recover the initially scrambled data and the CRC checksum. 因此，CRC逻辑112除去CRC校验和，按照传统的方式检查加扰数据，并将其提供给解扰逻辑114,以便利用已知的基站解扰码进行解扰，从而恢复最初发射的数据116。 Accordingly, CRC logic 112 CRC checksum and removed, in a conventional way, checks the scrambled data, and supplies it to the descrambling logic 114, to take advantage of the known base station de-scrambling code to recover the originally transmitted data 116 . 与恢复数据116并行地，CQI，或者至少足以在基站14产生CQI的信息被确定并被传送给基站14。  In parallel with the recovered data 116, CQI, or at least sufficient to generate CQI information in the base station 14 is determined and transmitted to the base station 14. 如上所述，CQI可以是载波干扰比（CR)，以及信道响应在0FDM频带中的各个子载波内的变化程度的函数。 As described above, CQI can be a carrier to interference degree of change in the function of each subcarrier band in 0FDM ratio (CR), and the channel response. 用于传送信息的0FDM频带中每个子载波的信道增益被相互比较，以确定信道增益在0FDM频带内的变化程度。 0FDM frequency band for communicating information in each sub-carrier channel gains are compared with one another to determine the degree of change in channel gain 0FDM band. 尽管可以采用各种技术来测量变化程度，不过一种技术是计算用于传送数据的整个0FDM频带中每个子载波的信道增益的标准偏差。 While various techniques can be employed to measure the degree of variation, one technique is however 0FDM entire data transmission band calculating a standard deviation of the channel gain for each subcarrier. 图1-5都提供了可被用于实现本发明的实施例的通信系统或其元件的具体例子。  Figures 1-5 provide a specific example may be used to implement embodiments of a communication system or elements of the present invention. 显然可利用具有不同于所述具体例子的体系结构，但是按照和这里说明的实施例的实现一致的方式工作的通信系统实现本发明的实施例。 Obviously architecture may be utilized having different than the specific example, the communication system operating according to a consistent way of example and embodiments described herein of the present invention is implemented. 鉴于上面的教导，本发明的众多修改和变化是可能的。  In view of the above teachings, numerous modifications and variations of the present invention are possible. 于是在附加权利要求的范围内，可以不同于这里具体说明的那样实践本发明。 Thus within the scope of the appended claims, the present invention may be practiced otherwise than as specifically described herein. 1. 一种在OFDM发射器传输数据的方法，包括： 对于多个帧中的每个： 把每个帧分成多个子帧，其中每个子帧具有相同的持续时间； 沿着子帧边界在单播模式和广播模式之间划分所述帧，以使得一个或多个所述子帧对应于单播模式，而其余子帧对应于广播模式； 在所述帧中安排多个OFDM符号，以使得广播模式子帧包括具有第一长度的保护间隔的OFDM符号，所述第一长度的保护间隔比在一个或多个单播模式子帧中的OFDM符号所使用的第二长度的保护间隔长；以及在其中每一帧具有相同的帧持续时间的一系列帧中传输该帧，其中用于单播模式的至少一个信令信道和导频信道在一个或多个所述广播模式子帧中传输，其中所述一个或多个单播模式子帧的各个部分被用于单小区广播传输。 OFDM transmitter 1. A method of transmitting data, comprising: for each of a plurality of frames of: dividing each frame into a plurality of subframes, wherein each subframe having the same duration; subframe boundary along a single between the multicast mode and broadcast mode of dividing the frame, such that one or more of the subframe corresponds to a unicast mode, while the remaining sub-frame corresponding to a broadcast mode; arranging a plurality of OFDM symbols in the frame, such that broadcast mode subframe includes OFDM symbol having a first length of the protection interval, the first guard interval length is longer than a second length in a protective or more unicast mode OFDM symbols in a subframe interval used; and in which a series of frames with each frame having the same frame duration of the transmission frame, wherein the at least one signaling pattern for unicast channel and a pilot channel transmitted in a broadcast mode or more of the sub-frame wherein each of the single-cell broadcast transmission portion of the one or more unicast sub-frame mode is used. 2.按照权利要求1所述的方法，还包括对于所述一系列帧中的每一帧，使OFDM发射器的传输与至少一个其他发射器的传输同步，从而所述发射器同步地划分单播模式和广播模式，其中所述OFDM发射器和所述至少一个其他发射器属于不同基站。 2. The method according to claim 1, further comprising for each frame of said series of frames, so OFDM transmitter transmitting at least one transmission with another transmitter synchronized to the transmitter synchronization dividing Single multicast mode and broadcast mode, wherein the OFDM transmitter and the at least one other transmitter belonging to different base stations. 3.按照权利要求1所述的方法，其中，所述划分对于所述一系列帧中的每一帧都相同， 其中，对于所述一系列帧中的每一帧，所有单播模式子帧需要在时间上是连续的，并且所有广播模式子帧需要在时间上是连续的。 3. The method according to claim 1, wherein the dividing the same for each frame of said series of frames, wherein, for each frame of said series of frames, all of the unicast mode subframes We need to be continuous in time, and all of the subframes required broadcast mode is continuous in time. 4. 一种接收数据的方法，包括： 接收其中每个帧具有相同的帧持续时间的一系列帧，其中所述每个帧包括多个子帧， 其中每个帧的每个子帧具有相同的子帧持续时间，其中，在每个帧中，一个或多个所述子帧对应于单播模式，而其余子帧对应于广播模式，其中，在每个帧内安排多个OFDM符号，以使得广播模式子帧包括具有第一长度的保护间隔的OFDM符号，所述第一长度的保护间隔比在一个或多个单播模式子帧中的OFDM符号所使用的第二长度的保护间隔长； 从接收的帧的至少一个帧中提取从中确定帧结构的信息；以及根据帧结构确定接收的帧中的所述多个OFDM符号； 其中帧结构限定了每个帧中的子帧在单播模式和广播模式之间的划分，其中所述划分对于所述每个帧都相同。 4. A method of receiving data, comprising: receiving a series of frames wherein each frame having the same frame duration, wherein each of said sub-frame comprising a plurality of frames, wherein each sub-frame each sub-frame having the same frame duration, wherein, in each frame, one or more of the subframe corresponds to a unicast mode, while the remaining sub-frame corresponding to a broadcast mode, wherein the plurality of OFDM symbols arranged in each frame, such that broadcast mode subframe includes OFDM symbol having a first length of the protection interval, the first guard interval length is longer than a second length in a protective or more unicast mode OFDM symbols in a subframe interval used; at least one frame is extracted from the received frame information is determined from a frame structure; and an OFDM symbol frame of the frame structure in accordance with the determined plurality of received; wherein the frame structure defining a sub-frame of each frame in unicast mode and the division between the broadcast mode, wherein the dividing the same for each frame. 5.按照权利要求4所述的方法，包括： 确定广播控制信道在多个OFDM符号中的位置；以及从广播控制信道中提取从中确定帧结构的信息，其中所述信息从多个帧结构中标识选定的帧结构，其中每个所述帧结构对应于子帧在单播模式和多播模式之间的不同划分。 The method according to claim 4, comprising: determining a location of a broadcast control channel in a plurality of OFDM symbols; and extracting information from the broadcast control channel frame structure is determined therefrom, wherein said plurality of frame configuration information from It identifies the selected frame structure, wherein each of the frame structure corresponding to a different sub-frame is divided between unicast mode and a multicast mode. 6. 按照权利要求4所述的方法，其中，对于所述一系列帧中的每一帧，所有单播模式子帧需要在时间上是连续的，并且所有广播模式子帧需要在时间上是连续的。 6. The method according to claim 4, wherein, for each frame of said series of frames, all of the sub-frame needs to unicast mode is continuous in time, and the broadcast mode to all subframes in time is required continuously. 7.-种OFDM发射器，包括： 处理器，操作为： 把帧分成多个子帧，其中每个子帧具有相同的持续时间； 沿着子帧边界在单播模式和广播模式之间划分所述帧，以使得一个或多个所述子帧对应于单播模式，而其余子帧对应于广播模式； 在所述帧中安排多个OFDM符号以支持来自所述发射器的OFDM符号传输，其中广播模式子帧包括具有第一长度的保护间隔的OFDM符号，所述第一长度的保护间隔比在一个或多个单播模式子帧中的OFDM符号所使用的第二长度的保护间隔长，其中所述处理器对在广播模式子帧中传输的OFDM符号和在所述一个或多个单播模式子帧中传输的OFDM符号米用公共的FFT大小；以及操作为在其中每个帧具有相同的帧持续时间的一系列帧中传输该帧的发射电路。 7.- species OFDM transmitter, comprising: a processor operative to: the frame into a plurality of subframes, wherein each subframe having the same duration; divided along a subframe boundary between unicast mode and broadcast mode, the frames, such that one or more of the subframe corresponds to a unicast mode, while the remaining sub-frame corresponding to a broadcast mode; arranging a plurality of OFDM symbols in the frame to support OFDM symbol transmission from the transmitter, wherein subframe includes a broadcast mode having a first OFDM symbol guard interval length, the second length of the guard interval guard interval length than the first length in the one or more unicast mode OFDM symbols in a subframe used, wherein the processor meters OFDM symbol transmission in a broadcast mode OFDM symbols in a subframe and transmitted in the one or more unicast sub-frame mode with a common FFT size; and an operation of each frame having therein transmitting circuit transmitting a series of frames in the frame of the same frame duration. 8.按照权利要求7所述的OFDM发射器，其中处理器操作为对于所述一系列帧中的每一帧，使传输与至少一个其他发射器同步，从而所述发射器同步地划分单播模式和广播模式， 其中所述OFDM发射器和所述至少一个其他发射器属于不同基站。 8. The OFDM transmitter according to claim 7, wherein the processor is operative to, for each frame of said series of frames, so that the at least one other transmission is synchronized with a transmitter so that the transmitter synchronization unicast divided mode and broadcast mode, wherein the OFDM transmitter and the at least one other transmitter belonging to different base stations. 9.按照权利要求7所述的OFDM发射器，其中处理器操作为通过下述来在所述帧中安排OFDM符号： 其中所有单播模式子帧在时间上连续，其中所有广播模式子帧在时间上连续。 9. The OFDM transmitter according to claim 7, wherein the processor is operable to be arranged by the following OFDM symbols in the frame: wherein all unicast mode subframes are continuous in time, which all broadcast mode subframe time in a row. 10.按照权利要求9所述的OFDM发射器，其中处理器操作为通过把帧分成五个子帧来把帧分成多个子帧。 10. The OFDM transmitter according to claim 9, wherein the processor is operable by frame into five subframes into a plurality of sub-frames to the frames. 11.按照权利要求7所述的OFDM发射器，其中处理器和发射电路协作为传输识别正在使用多个定义的帧结构中的哪个帧结构的帧结构标识符，每个定义的帧结构包括子帧在单播模式和广播模式之间的不同划分。 11. The OFDM transmitter according to claim 7, wherein the transmit circuit and the processor cooperating to transmit a frame structure which is being used to identify the identifier of the frame structure defined in a plurality of structures, each frame structure comprises a sub-defined different division frame between unicast mode and broadcast mode. 12.按照权利要求7所述的OFDM发射器，其中所述一系列帧包括以下至少之一： 只用于单播模式传输的帧；和只用于广播模式传输的帧。 12. The OFDM transmitter according to claim 7, wherein said series of frames includes at least one of the following: a frame only for unicast mode transmission; and only frames for broadcast mode transmissions. 13.-种OFDM发射器，包括： 处理器，操作为： 把帧分成多个子帧，其中每个子帧具有相同的持续时间； 沿着子帧边界在单播模式和广播模式之间划分所述帧，以获得单播模式部分和广播模式部分，其中所述单播模式部分包括一个或多个所述子帧，而所述广播模式部分包括其余子帧； 在所述帧中安排多个OFDM符号，以便支持来自所述发射器的OFDM符号传输，其中在该帧的单播模式部分中安排第一多个OFDM符号，并且在该帧的广播模式部分中安排第二多个OFDM符号，其中所述第二多个OFDM符号具有比所述第一多个OFDM符号更大的保护间隔值，其中所述第二多个OFDM符号包括用于广播传输的第三OFDM符号和用于单播传输的第四OFDM符号；以及操作为在其中每个帧具有相同的帧持续时间的一系列帧中传输该帧的发射电路，其中所述传输该帧包括： 在帧的使用较小保护间 13.- species OFDM transmitter, comprising: a processor operative to: the frame into a plurality of subframes, wherein each subframe having the same duration; divided along a subframe boundary between unicast mode and broadcast mode, the frame, to obtain a unicast mode portion and broadcast mode portion, wherein the unicast mode portion includes one or more of the subframe, and the broadcast mode portion including the remaining subframes; arranged in the frame a plurality of OFDM symbols to support OFDM symbol transmission from the transmitter, wherein the first plurality of OFDM symbols arranged in a unicast mode portion of the frame, and the arrangement of the second plurality of OFDM symbols in the broadcast mode portion of the frame, wherein the second plurality of OFDM symbols having a value greater than a guard interval of the first plurality of OFDM symbols, wherein the second plurality comprising a third OFDM symbol OFDM symbols for broadcast transmission and unicast transmission for a fourth OFDM symbols; and wherein each frame in the operative to transmit circuit having a series of frames of the same frame duration frame transmission, wherein said transmitting the frame comprises: using a smaller inter-frame protection 隔值的单播模式部分中单播所述第一多个OFDM符号； 在帧的使用较大保护间隔值的广播模式部分中广播所述第三OFDM符号；以及在帧的使用较大保护间隔值的广播模式部分中单播所述第四OFDM符号。 Unicast mode portion unicast compartment value of the first plurality of OFDM symbols; broadcasting the third OFDM symbol in a broadcast mode to use a larger portion of the protective frame interval value; and the use of large protective frame interval broadcast mode value of the fourth section of the unicast OFDM symbol. 14. 一种OFDM发射器，包括： 处理器，操作为： 把帧分成多个子帧，其中每个子帧具有相同的持续时间； 沿着子帧边界在单播模式和广播模式之间划分所述帧，以获得单播模式部分和广播模式部分，其中所述单播模式部分包括一个或多个所述子帧，而所述广播模式部分包括其余子帧； 在所述帧中安排多个OFDM符号，以便支持来自所述发射器的OFDM符号传输，其中在该帧的单播模式部分中安排第一OFDM符号，并且在该帧的广播模式部分中安排第二OFDM符号，其中所述第二OFDM符号具有比所述第一OFDM符号更大的保护间隔值；以及操作为在其中每个帧具有相同的帧持续时间的一系列帧中传输该帧的发射电路，其中所述传输该帧包括： 在帧的使用较小保护间隔值的单播模式部分中传输所述第一OFDM符号，其中单播模式部分的子集用于单小区广播传输； 在帧的使用 14. An OFDM transmitter, comprising: a processor operative to: the frame into a plurality of subframes, wherein each subframe having the same duration; divided along a subframe boundary between unicast mode and broadcast mode, the frame, to obtain a unicast mode portion and broadcast mode portion, wherein the unicast mode portion includes one or more of the subframe, and the broadcast mode portion including the remaining subframes; arranged in the frame a plurality of OFDM symbols to support OFDM symbol transmission from the transmitter, wherein the first OFDM symbol is arranged in a unicast mode portion of the frame, and arranged in a second OFDM symbol broadcast mode portion of the frame, wherein the second OFDM symbol with a guard interval value greater than the first OFDM symbol; and transmitting circuit is operated as the frame in which each frame has the same frame duration to transmit a series of frames, wherein said transmitting the frame comprises : in the unicast mode portion of the guard interval using a smaller value of the first frame transmitted OFDM symbols, wherein the subset of the unicast mode portion for single-cell broadcast transmissions; in frame 大保护间隔值的广播模式部分中广播所述第二OFDM符号。 Broadcast mode interval value greater protection portion broadcasting the second OFDM symbol. 15. -种接收包括多个OFDM符号的帧的接收器，所述接收器包括： 操作为从通信网络无线接收帧的接收电路，其中所述帧包括多个子帧，其中每个子帧具有相同的持续时间，其中所述帧包括单播模式部分和广播模式部分，其中广播模式部分包括具有第一长度的保护间隔的OFDM符号，所述第一长度的保护间隔比在单播模式部分中的OFDM符号所使用的第二长度的保护间隔长，其中通过为单播模式部分中的OFDM符号和广播模式部分中的OFDM符号使用公共的采样频率和公共的FFT大小来接收所述帧；以及处理器，操作为： 确定接收的帧的帧结构，所述帧结构识别所述帧的单播模式部分和广播模式部分；以及检测所述帧的单播模式部分中的OFDM符号和所述帧的广播模式部分中的OFDM符号， 其中所述检测是按照帧结构进行的。 15. - kind receiver for receiving a frame including a plurality of OFDM symbols, the receiver comprising: receive circuitry operative to receive a frame from a wireless communication network, wherein said frame comprises a plurality of subframes, wherein each subframe has the same duration, wherein said frame comprises a unicast mode portion and broadcast mode portion, wherein the broadcast mode portion includes a length having a first OFDM symbol guard interval, the first guard interval length than unicast mode OFDM portion a second length of the guard interval length, wherein said frame is received by an OFDM symbol and a broadcast mode portion of the unicast mode portion of the OFDM symbols using a common sampling frequency and a common FFT size used symbols; and a processor , operative to: determine a frame structure of a received frame, said frame unicast mode portion and a broadcast mode portion of the frame structure recognition; unicast and a broadcast mode portion of the frame is detected OFDM symbols of the frame and OFDM symbol pattern portion, wherein the detecting is performed according to the frame structure. 16. 按照权利要求15所述的接收器，其中所述处理器操作为确定广播控制信道在所述帧内的位置，并从广播控制信道中提取帧结构的标识符。 16. The receiver of claim 15, wherein the processor is operative to determine a broadcast channel position in the frame, the frame structure and extracting an identifier from a broadcast control channel. 17. -种操作通信网络的方法，包括： 操作多个电信小区，每个小区包含至少一个发射器，并被分成至少两个部分； 操作至少一个子网，所述至少一个子网由所述多个电信小区中的至少两个相邻电信小区的各部分构成，所述至少一个子网由全部所述至少两个相邻电信小区的用于广播传输的发射器支持， 其中所述至少一个子网的发射器适合于在相同的传输帧结构中按照单播模式和广播模式两者传输OFDM符号，其中所述传输帧结构被分为多个子帧，其中每个子帧具有相同的持续时间，其中一个或多个子帧对应于单播模式，而其余子帧对应于广播模式，其中一个或多个广播模式子帧包括具有第一长度的保护间隔的OFDM符号，所述第一长度的保护间隔比在一个或多个单播模式子帧中的OFDM符号所使用的第二长度的保护间隔长。 17. - kind of operating a communications network, comprising: operating a plurality of telecommunication cells, each cell comprising at least one transmitter and divided into at least two portions; at least one sub-operation, by the at least one subnetwork a plurality of telecommunication cells each of at least two adjacent portions constituting the telecommunication cells, the at least one emitter support for subnet broadcast transmission by the telecommunication cell adjacent to all of the at least two, wherein the at least one the transmitter is adapted to the subnet in a unicast mode and broadcast mode transmission of OFDM symbols of both, wherein the transmission frame structure is divided into a plurality of sub-frames in the same transmission frame structure, wherein each of the sub-frames have the same duration, wherein one or more subframes corresponding to the unicast mode, while the remaining sub-frame corresponding to a broadcast mode, broadcast mode wherein the one or more subframe includes OFDM symbol having a first length of the guard interval, the first guard interval length a second length longer than the guard at the one or more unicast mode OFDM symbols in a subframe interval used. 18. 按照权利要求17所述的方法，其中，当存在大于一个的子网时，至少一个子网传输不同于其它子网的内容。 18. The method according to claim 17, wherein, when there is more than one subnet, different from the content of the at least one subnet to other subnets transmission. 19. 按照权利要求17所述的方法，其中当存在大于一个的子网时，所述子网传输相同的内容。 19. The method of claim 17, wherein when more than one subnet, the subnet of the same transmission content is present. 20. 按照权利要求19所述的方法，包括通过在不同子网中利用不同扰码，操作每个子网以减轻由相邻子网传输的相同内容的传播延迟引起的干扰。 20. The method according to claim 19, including through the use of different scrambling codes in a different subnet, each subnet operate to reduce the propagation delay of the same content subnet adjacent transmission interference caused. 21.按照权利要求17所述的方法，还包括使由所述至少一个子网的每个发射器传输每一帧同步。 21. A method as claimed in claim 17, further comprising a transmitter transmitting each of the at least one of each of the sub-frame synchronization. MX2017001613A (en) 2014-08-07 2018-01-24 Coherent Logix Inc Multi-partition radio frames. Owner name: YANXING BIDEKE CO., LTD.
Free format text: FORMER OWNER: NORTEL NETWORKS CORP.
Free format text: FORMER OWNER: YANXING BIDEKE CO., LTD.